To teach and to inquire into the nature of things. 'To serve' was later added to the motto without changing the seal, so the university motto in English now is "To teach, to serve, and to inquire into the nature of things." University town; 762 acres (3.08 km2) (Main campus) 41,539 acres (168.10 km2) (Total). The Center for Measuring University Performance ranks the University of Georgia among the top research universities in the nation and the university is classified by the Carnegie Classification of Institutions of Higher Education as a Research I university (having highest extensive research activity). It also classifies the student body as "more selective," its most selective admissions category, while the ACT Assessment Student Report places UGA student admissions in the "highly selective" category, the highest category. Incoming students include those from nearly every state and 47 countries around the world. The university is ranked as one of the "Best National Universities for Undergraduate Teaching" (tied with such universities as Harvard and Columbia), tied for 13th overall among all public national universities in the 2019 U.S. News & World Report rankings, and is a Kiplinger's and Princeton Review top ten in value. The university is organized into 17 constituent schools and colleges offering more than 140 degree programs. The university's historic North Campus is listed on the U.S. National Register of Historic Places as a designated historic district. The contiguous campus areas include rolling hills, gardens, and extensive green space including nature walks, fields, shrubbery, and large and varied arboreta. Close to the contiguous campus is the university's 58-acre Health Sciences Campus that also has an extensive landscaped green space, more than 400 trees, and several additional historic buildings. Athens has consistently ranked among America's best college towns primarily due to its vibrant restaurant, bar, and music scenes. In addition to the main campus in Athens with its approximately 460 buildings, the university has two smaller campuses located in Tifton and Griffin. The university has two satellite campuses located in Atlanta and Lawrenceville. The university operates several service and outreach stations spread across the state. The total acreage of the university in 30 Georgia counties is 41,539 acres (168.10 km2). The university also owns a residential and research center in Washington, D.C., and three international residential and research centers located at Oxford University in Oxford, England, at Cortona, Italy, and at Monteverde, Costa Rica. Over 750 student organizations including academic associations, honor societies, cultural groups, varsity and intramural athletics, publications, religious groups, social groups and fraternities, volunteer and community service programs, and philanthropic groups are integral parts of student life. The University of Georgia's intercollegiate sports teams, commonly known by their Georgia Bulldogs nickname, compete in National Collegiate Athletic Association (NCAA) Division I and the Southeastern Conference (SEC). UGA served as a founding member of the SEC in 1932. In their more than 120-year history, the university's varsity sports teams have won 45 national championships, 264 individual national championships, 170 conference championships, and 45 Olympic medals. The Georgia Redcoat Marching Band, the official marching band of the university, performs at athletic and other events. In 1784, Lyman Hall, a Yale University graduate and one of three doctors to sign the Declaration of Independence, as Governor of Georgia persuaded the Georgia legislature to grant 40,000 acres (160 km²) for the purposes of founding a "college or seminary of learning." Besides Hall, credit for founding the university goes to Abraham Baldwin who wrote the original charter for University of Georgia. Originally from Connecticut, Baldwin graduated from and later taught at Yale University before moving to Georgia. The Georgia General Assembly approved Baldwin's charter on January 27, 1785 and UGA became the first university in the United States to gain a state charter. Considered one of the Founding Fathers of the United States, Baldwin would later represent Georgia in the 1786 Constitutional Convention that created the Constitution of the United States and go on to be President pro tempore of the United States Senate. The task of creating the university was given to the Senatus Academicus, which consisted of the Board of Visitors – made up of "the governor, all state senators, all superior court judges and a few other public officials" – and the Board of Trustees, "a body of fourteen appointed members that soon became self-perpetuating." The first meeting of the university's Board of Trustees was held in Augusta, Georgia on February 13, 1786. The meeting installed Baldwin as the university's first president. For the first sixteen years of the school's history, the University of Georgia only existed on paper. By the new century, a committee was appointed to find suitable land to establish a campus. Committee member John Milledge purchased 633 acres of land on the west bank of the Oconee River and immediately gifted it to the university. This tract of land, now a part of the consolidated city–county of Athens-Clarke County, Georgia, was then part of Jackson County. As of 2013[update], 37 acres of that land remained as part of the North Campus. Because Baldwin was elected to the U.S. Senate, the school needed a new president. Baldwin chose his former student and fellow professor at Yale, Josiah Meigs, as his replacement. Meigs became the school's president, as well as the first and only professor. After traveling the state to recruit a few students, Meigs opened the school with no building in the fall of 1801. The first school building patterned after Yale's Connecticut Hall was built the year later. Yale's early influence on the new university extended into the classical curriculum with emphasis on Latin and Greek. By 1803, the students formed a debate society, Demosthenian Literary Society. Meigs had his first graduating class of nine by 1804. 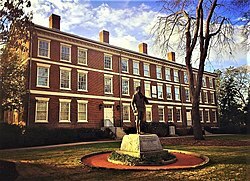 In 1806, the school dedicated the first legacy building, Franklin College (named after Benjamin Franklin). The building is now known as Old College. After the tenure of the next two presidents, John Brown (1811–1816) and Robert Finley (1819), a timeframe which saw enrollment drop, presidents Moses Waddel (1819–1829) and Alonzo S. Church (1829–1859) worked to re-engage new students. By 1859, enrollment had risen to 100 students, the university employed eight faculty members and opened a new law school. During this timeframe, the university erected the New College building followed by the Chapel in 1832. Church was the longest-serving president in UGA history. In 1859, the state legislature abolished the Senatus Academicus, leaving the Board of Trustees as the only official governing body. When Church retired, Andrew A. Lipscomb was appointed to the newly renamed position of chancellor in 1860. UGA closed in September 1863 due to the Civil War and reopened in January 1866 with an enrollment of about 80 students including veterans using an award of $300 granted by the General Assembly to former soldiers under an agreement that they would remain in Georgia as teachers after graduation. The university received additional funding through the 1862 Morrill Act which was used to create land grant colleges across the nation. In 1872, the $243,000 federal allotment to Georgia was invested to create a $16,000 annual income used to establish the Georgia State College of Agriculture and Mechanic Arts (A&M), initially separate and independent from the UGA. However, A&M's funding was considered part of the university, which helped save it from bankruptcy during the Reconstruction era. As a land-grant school, UGA was required to provide military training which the university began to offer in the 1870s. Several of the university's extracurricular organizations began in the late 1800s. In 1886, fraternities at UGA began publishing the school's yearbook, the Pandora. The same year, the university gained its first intercollegiate sport when a baseball team was formed, followed by a football team formed in 1892. Both teams played in a small field west of campus now known as Herty Field. The Demosthenian and Phi Kappa literary societies together formed the student paper, The Red & Black, in 1883. In 1894, UGA joined six other southeastern schools to form the Southern Intercollegiate Athletic Association (SIAA). The turn of the century brought many changes in the administration and organization of the university including the naming of a new chancellor in 1899. Walter B. Hill became the first UGA alumnus to lead the university. A progressive and enlightened leader, his six-year tenure, before his death from pneumonia, was marked with increased enrollment, expansion of the university's course offerings, and the addition of state funding through appropriation, for the first time bringing the university's annual income to over $100,000 in 1902. Hill and his successors David C. Barrow (1906–1925), Charles Snelling (1926–1932), Steadman Sanford (1932–1935) would grow the school to take on the role of a true university. Many of the university's schools and colleges were established during Barrow's tenure. The School of Pharmacy (1903), the School of Forestry (1906), the School of Education (1908), the Graduate School (1910), the School of Commerce (1912), the School of Journalism (1915), and the Division of Home Economics (1918) were all established during this period. In 1906, UGA also incorporated the College of Agriculture by bringing together A&M and another college of science and engineering, both formed in the previous century. Connor Hall became the first building built in South Campus and first of several buildings that housed the university's agriculture programs on what came to be known as "Ag Hill". In 1914, the first Phi Beta Kappa chapter in the state of Georgia was founded at UGA. In 1923, another honor society, Phi Kappa Phi, established a chapter at the university. In 1920, UGA's athletic program was among 14 of the 30 universities to leave the SIAA to form the Southern Conference. With students limited to white males for the first century of its history, University of Georgia began admitting white female students during the summer of 1903 as postgraduate students to the State Normal School established in 1893 a few miles west of the campus. When UGA established a Graduate School in 1910, female students were permitted to attend summer classes and some were also unofficially allowed to attend regular classes as well. However, at that time only junior college transfers majoring in Home Economics were integrated into regular courses. Before official admission of women to the university, several women were able to complete graduate degrees through credit earned during the summer sessions. The first white woman to earn such a degree was Mary Dorothy Lyndon. She received a Master of Arts degree in 1914. Women were admitted as full-time undergraduates in 1918. Mary Ethel Creswell earned a B.S. in Home Economics in June 1919, becoming the first women to earn an undergraduate degree at the university. Two UGA dormitories were later named after these graduates: Mary Lyndon Hall and Creswell Hall. In 1920, the university opened its first women's dormitory, Soule Hall. This postcard depicts Mary Lyndon Hall (built in 1938), named after the first female student at UGA to earn a graduate degree. In 1932, the reorganization of the university's administrative structure continued through the establishment of the University System of Georgia (USG) which brought UGA along with several other public colleges in the state under the control of a single Board of Regents. The State Normal School (later State Teachers College) was fully absorbed by the College of Education, with the former's previous campus becoming UGA's Coordinate Campus. UGA and Georgia Tech traded several school programs; all engineering programs (except agriculture) were transferred to Georgia Tech and UGA received Georgia Tech's commerce program in return. The title of the university's lead administrator was changed from chancellor back to the original title of president. Sanford was named UGA's first president since 1860 and was succeeded by Harmon Caldwell (1935–1948). In 1933, the Division of Home Economics was reorganized as the School of Home of Economics, with UGA's first female graduate Creswell appointed as dean. The university also became a founding member of the Southeastern Conference (SEC) and established the University of Georgia Press in 1938. Throughout this period, UGA's enrollment grew every year with student population reaching 3,000 by 1937 and almost 4,000 by 1941. Through President Franklin D, Roosevelt's New Deal, UGA received a $2 million infusion of funding and an additional $1 million from the state legislature. The university used the new funds to make a number of improvements to the campus from 1936 to the early 1940s. Many renovation projects were undertaken including the establishment of five new residence halls, a dining hall, eight new academic buildings, a nursery school and several auxiliary facilities. An engineering professor Rudolph Driftmier and architect Roy Hitchcock were responsible for the design of several buildings in the neoclassical style, giving the campus a homogeneous and distinctive appearance. The funds were also used to pave roads, build sidewalks and improve the campus's landscaping. The dean of the College of Education in 1941, Walter Cocking, was fired by Georgia Governor Eugene Talmadge in a controversial decision known as the Cocking affair. Talmadge was motivated by his belief that Cocking favored racial integration. The governor's interference in the workings of USG's Board of Regents prompted a response by the Southern Association of Colleges and Secondary Schools which stripped UGA and nine other schools in the system of their accreditation. The issue became a major point of contention in Talmadge's 1942 reelection campaign. After his loss, a constitutional amendment passed by the state legislature gave the Board of Regents independence from political interference, which led to the schools quickly regaining their accreditation. As the United States entered World War II, enrollment among male students dropped significantly, allowing female students to outnumber male students for the first time in the school's history. In 1945, UGA accepted a donation of about 100 paintings from the New York art collector Alfred Holbrook and created the Georgia Museum of Art. In 1946, the School of Veterinary Medicine was re-established as a separate school, 13 years after it was discontinued as part of the agricultural college. The following year, the quarterly literary journal The Georgia Review began publication. After Jonathan Rogers' brief tenure as president (1949–1950), Omer Clyde Aderhold started his 17-year-long stint as UGA president. During his tenure, the university sold Coordinate Campus to the U.S. Navy. He opened the school's main library, the Ilah Dunlap-Little Memorial Library, in 1952, and in 1964, established the School of Social Work. The university also built a new Science Center on South Campus consisting of six buildings. After UGA's pharmacy school moved to the new facility on the South Campus, the two portions of the campus took on distinct characteristics, with North Campus focused on arts, humanities, and law, and South Campus focused on natural sciences and agricultural programs. UGA was racially integrated in 1961, with the admission of Hamilton E. Holmes and Charlayne Hunter. Holmes and Hunter, who were previously denied admission in 1959, were allowed to enroll in spring 1961. On January 9, 1961, three days after a court decision granting them admission, Holmes and Hunter "walked through the Arch and into the Academic Building" to register for classes. On the 40th anniversary of the event, the university renamed the very same prominent campus building where they registered as the Holmes-Hunter Academic Building, and the university now presents the Holmes-Hunter Lectures, which series brings noted African-American speakers to the campus each year to discuss racial issues. Holmes graduated Phi Beta Kappa and was the first African-American student to attend the Emory University School of Medicine, where he earned his M.D. in 1967 and later became an professor of orthopedics and associate dean at Emory, the medical director at Grady Memorial Hospital, and a trustee of the University of Georgia Foundation, the university's private fund-raising organization. Hunter (later, Hunter-Gault) graduated with a degree in journalism and had an exceptional career, earning several awards including two Emmys and a Peabody for excellence in broadcast journalism. In June 1961, Holmes and Hunter were joined by another African American, Mary Frances Early, who transferred to the school as a graduate student. Before Holmes and Hunter, Early became the first African American to graduate from UGA in 1962. The College of Education later established a professorship in her honor. In 1968, Fred Davison was appointed UGA president and served in the position for 19 years. During his tenure, the school's research budget increased from $15.6 million to more than $90 million. UGA inaugurated the School of Environmental Design, was designated as a Sea Grant College, and built 15 new buildings on campus. By the 1970s, the University of Georgia ranked among the top 50 research universities in the U.S. and in 1973, the Carnegie Commission on Higher Education designated UGA as Research I university. By the time the school celebrated its bicentennial with a 15-month-long celebration, student enrollment had grown to about 25,000. In the end, Davison's tenure as president was marred by the controversy surrounding the dismissal of Jan Kemp, a faculty member who also tutored student athletes. Kemp filed a lawsuit against the university which garnered national media attention and led to criticism of UGA's lax academic standards for students in its athletic programs. The courts awarded Kemp more than $1 million, leading to Davison's resignation in 1986. A former president of the University of Miami, Henry King Stanford, briefly served as interim president before the appointment of Charles Knapp in 1987. Together with UGA alumnus and Georgia Governor Zell Miller, Knapp helped establish the state's HOPE Scholarship in 1993 with funds appropriated from the new state lottery. The campus hosted three events in the 1996 Summer Olympics: rhythmic gymnastics, volleyball, and the finals in women's soccer. In 1997, Knapp was succeeded by Michael Adams who served as UGA president for 16 years, well into the 21st century. Adams began a strategic plan to grow the university's academic programs in the new century. In 2001, UGA inaugurated the College of Environment & Design and the School of Public and International Affairs, the first new schools to open since 1964. The strategic plan also chose medicine and health sciences as a major focus of growth and development. Together with Provost Karen Holbrook and Arnett Mace (who succeed Holbrook), Adams opened the Biomedical and Health Sciences Institute, the UGA Cancer Center, the Center for Tropical and Emerging Global Diseases, and the Regenerative Bioscience Center. In 2005, the College of Public Health was created to bring together the various medical and health sciences programs. 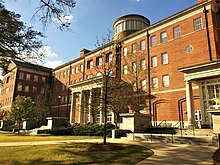 In 2011, UGA purchased back the former campus of the State Normal School from the U.S. Navy to create the UGA Health Sciences Campus in partnership with the Medical College of Georgia. The newly reacquired campus also became home to the College of Public Health. The Odum School of Ecology (2007) and the College of Engineering (2012) became the fourth and fifth schools to open during Adams's tenure. After Adams's retirement on June 30, 2013, Jere Morehead was appointed as UGA's 22nd president. Morehead is an alumnus of UGA's law school and previously served as provost and vice president of academic affairs. Under Morehead, UGA continues its focus on research with a $458 million budget as of the 2017 fiscal year, placing 54th on the National Science Foundation rankings. In 2015, the College of Veterinary Medicine moved its teaching hospital to a new off-campus facility, leaving its previous building vacant. Two students became recipients of Rhodes Scholarships in 2013 and 2017, respectively, bringing the total number of students to receive the honor in UGA's history to 24. As of 2017[update], UGA ranked 13th among "Leading Institutions by Study Abroad Total", published in the Open Doors Report of the Institute of International Education. In September 2017, UGA used a combination of private and public funds to complete the second of three phases to build the Terry College of Business complex. The project has four buildings completed and will include a total of six buildings upon completion of the third phase. The President of the University of Georgia (Jere Morehead) is the head administrator and is appointed and overseen by the Georgia Board of Regents. University of Georgia has had 22 presidents since its founding in 1785. Each individual college and school is headed by a dean. The university has a student-to-faculty ratio of 17 students per faculty member. According to the 2018–2019 estimated cost of attendance, based on a nine-month academic year for an average undergraduate student, the tuition and fees for Georgia residents is $11,830, and $30,404 for non-residents. The tuition and fees for an average international undergraduate student (based on a nine-month academic year) is $30,392. Nonetheless, non-residents may become residents within a year and are thereafter subject to tuition and fees as residents. The university is also home to the University of Georgia/Medical College of Georgia Medical Partnership that provides education leading to the Doctor of Medicine (M.D.) degree and facilities for medically related education and research at the University of Georgia. The University of Georgia's main campus is made up of 465 buildings covering an area of about 762 acres (308 hectares). The university owns an additional 39,743 acres (160.83 km2) of land in 31 counties across Georgia. As of October 2016, UGA employed 10,665 people of which more than 3,000 are faculty members. The main campus sits across from Athens, a consolidated city–county located 60 miles northeast of downtown Atlanta, Georgia. The city is the hometown of several popular musical artists including the American rock bands The B-52's and R.E.M. Rolling Stone magazine named UGA among "Top Ten Schools that Rock". In August 2015, Outside magazine named Athens sixth on a list of "The 16 Best Places to Live in the U.S." According to Southern Living, UGA has one of the most beautiful campuses in the Southern United States. The campuses' dominant architectural themes are Federal, Classical and Antebellum style. Though there have been many additions, changes, and augmentations, the University of Georgia's campus maintains its historic character. In 2000, the entire campus was designated as an arboretum, the University of Georgia Campus Arboretum. It is estimated to be home to about 9,000 trees with over 154 identified species including native trees such magnolias, red oaks, white oaks, and beeches, as well as non-native trees such as the North Africa Atlas cedar, the Chinese parasol and royal paulownia, and the Japanese zelkova and black pine. The main campus is traditionally divided into five sections, North, South, Central, East and West Campuses. The university has academic, research, residential, dining, and athletic facilities spread throughout the campus and on several off-campus facilities. The North Campus is bounded by Baldwin Street to the south, Lumpkin Street to the west, Broad Street to the north and traditionally by Jackson Street to the east, but also extends past Jackson Street to East Campus Road. Several of the buildings that make up the old campus are designated as historic, covering part of the 37 acres (15 hectares) originally gifted to the university in 1801. The entire Old North Campus of the University of Georgia is listed in the National Register of Historic Places as a historic district. Located at a central location in North Campus and constructed in 1806 as the first permanent building, Old College is the oldest building in Athens and one of the oldest in Northeast Georgia. The building closely resembles Yale University's Connecticut Hall. It was designed with identical front and back to allow the university to grow in either direction. Currently housing the Franklin College of Arts and Sciences, the building originally served both instructional and residential purposes. New College was built in 1823 as a residence hall and was rebuilt in 1832. Other historic buildings in the National Historic District include Waddel Hall, Demosthenian Hall, The Chapel, Phi Kappa Hall, Lustrat Hall, Moore College, and Holmes–Hunter Academic Building. Named after UGA's fifth president, Waddell Hall is the second-oldest building on campus. Built in the Federal style of architecture in 1821, it is also one of the smallest buildings on campus. Home to the oldest student organization at UGA since 1824, Demosthenian Hall and Demosthenian Literary Society are named after the Greek orator Demosthenes. Located between New College and Demosthenian Hall, The Chapel is a Greek Revival-style building which resembles a classic temple. Considered as "the most beautiful building on campus", the interior features a large painting of the nave and aisles of the St. Peter's Basilica, painted by the artist George Cooke. Also built in the Greek Revival style in 1836, Phi Kappa Hall is home to the university's second-oldest student organization, Phi Kappa Literary Society, founded in 1820 to rival UGA's first debate society. The seventh-oldest building on campus, Lustrat Hall was originally built in 1847, north of its current location. Named after its last faculty occupant, it is the only remaining faculty residence house from Old North Campus. Used for a variety of purposes in the past, the building most recently houses the Office of Legal Affairs. Built in 1874, Moore College is the only remaining building constructed during post-Civil War Reconstruction. Originally home to the College of Agriculture and Mechanic Arts, Moore College currently houses the university's Honors Program. The Holmes/Hunter Academic Building was simply known as the Academic Building when it was originally assembled in 1905. Following a Beaux-Arts architectural design by engineering professor Charles Strahan, the building was constructed by inserting a new building in between the older Ivy Building and Old Library. In 2001, the building was renamed after the first two African-American students at UGA. It houses the Office of the Registrar, and several other administrative offices. Also listed in the National Register of Historic Places is the Founders Memorial Garden which is named in honor of the Ladies Garden Club of Athens. Founded in 1891, it was the first garden club in the United States. Throughout the historic buildings, several architectural, sculptural, and landscape features adorn the North Campus. Chief among them is The Arch which serves as the traditional entrance to the campus. Built in 1858 and modeled after the Great Seal of the State of Georgia, the area near the three-columned gate is a popular venue for the staging of demonstrations, gatherings, protests, and rallies. Although the Seal's three pillars represent the state's three branches of government, the pillars of The Arch are usually taken to represent the Georgia Constitution's three principles of wisdom, justice, and moderation, which are engraved over the pillars of the Seal. On the opposite side of the Arch Quad, at the front of the Old College building sits a statue of the university's founder Abraham Baldwin, installed by the University of Georgia Alumni Association. The President's Club Garden, first planted in 1973 on the opposite side of the Old College building, honors the thousands of families who have made major financial contributions to the university. A fountain named after Hubert B. Owens and built in 1989 is tucked in the space between Old College, Lustrat House, and the Administration Building. Serving as a UGA faculty member for 45 years, Owen was responsible for initiating the university's landscape architecture program, which later grew into the College of Environment and Design. The Administration Building is another one of the later additions to the North Campus built in 1905 with $50,000 donated to the university from a major contributor, the philanthropist George Foster Peabody. It was the first building on campus designed to be fireproof in light of the fact that several fires in UGA's history have destroyed key buildings. Originally used as the location for a library, it houses the offices of the university president and other senior administrative offices. Hirsch Hall was built in 1932 in Georgian style and named after Harold Hirsch who for a long period served as general counsel to The Coca-Cola Company. The building is home to the School of Law and the Alexander Campbell King Law Library located in a north-side addition built in 1967. Hirsch Hall connects by way of an overhead bridge to the J. Alton Hosch Law Library Annex built in 1981 and named after the former dean of the law school. The university's main library, the Ilah Dunlap Little Memorial Library, was built with funds bequeathed by its namesake, the wife of a UGA alumnus who stipulated several design requirements including that it face north across the mall towards Old College. Home to the University of Georgia Press and the Georgia Review, the library serves as the headquarters to a network of secondary libraries located throughout the campus. Following the addition of a seven-story annex in 1974, the library became the third-largest academic building at UGA and the largest in North Campus. The main library is part of a quad consisting of Hirsch Hall, Old College, Waddell Hall and Peabody Hall. Although the aforementioned George Foster Peabody also contributed to funds used to build Peabody Hall, the building is actually named after George Peabody who in an 1869 testamentary trust created a $2.25-million fund to benefit several universities in the South. UGA combined $40,000 from this fund with other contributions to construct Peabody Hall which houses the Departments of Religion and Philosophy and the Institute of Native American Studies. Located across Field Street from Central Campus to its north, South Campus is encircled by East Campus Road to its east, Pinecrest Drive to the south, and Lumpkin Street to the west. It is connected to the areas to its north by way of the Jim Gillis Bridge, named after the former director of the Georgia State Highway Board. South Campus is the largest of the five segments of the UGA campus, latitudinally stretching for more than a mile. Originally begun as an expansion to accommodate the growing agricultural programs in an area known as "Ag Hill", it is home most of the university's science and engineer programs. In 2006, work was completed on D. W. Brooks Mall to give the campus a more green aesthetic similar to North Campus, replacing parking lots and a section of the street by the same name which bisected the area lengthwise. Lumpkin House, also known as "Rock House", is the oldest building on South Campus, built in 1844. The building is named after its original owner, Wilson Lumpkin, the former Georgia congressman, governor, and U.S. Senator who designed and built the house as his retirement home. The building and the land surrounding it, on which the neighboring Connor Hall was built in 1908, was sold to the university by Lumpkin's youngest daughter who stipulated that ownership of the property would revert to her heirs if the university ever moved or destroyed the house. The house, used by the College of Agriculture and Environmental Sciences (CAES), "probably still stands only because of [this] odd clause" which the university continues to honor. In 1970, the building was added to the National Register of Historic Places. The second-oldest building, named after the state legislator James J. Conner, sits on one the highest points in Athens. Built in the Renaissance Revival style, Conner Hall also serves the CAES. In 1975, it underwent an interior renovation that left the exterior features unchanged. Barrow Hall, built in 1911, is the third-oldest building in South Campus and serves a variety of academic programs. Originally known as the Farm Mechanics Building, the building was renamed after Chancellor David C. Barrow, during whose tenure it was constructed. Home to the College of Family and Consumer Sciences, Dawson Hall was built in 1932 to house the university's growing home economics department, then part of the College of Agriculture. The building is named after William Terrell Dawson, a Georgian physician and grandson of the namesake to Terrell Hall. In his will, Dawson donated $150,000 for the creation of a trust to benefit agricultural education at UGA. In 1971, the school added an annex to Dawson Hall and later renamed it after Mary Spiers who was dean of the School of Home Economics from 1954 to 1971. The College of Family and Consumer Sciences also has five other buildings, built in 1939 and 1940, known collectively as the McPhaul Center. On the curved hill between Dawson Hall and Sanford Stadium, a plan envisioned in 1953, proposed the construction of a Science Center to house the university's various scientific programs. Between 1959 and 1960, six buildings were constructed to each house studies in Physics, Food Sciences, Geography–Geology, Chemistry, Biological Sciences, and Poultry Science. Located south of the Food Sciences Building, the Museum of Natural History manages several collections of artifacts and specimens from archaeology, biology, geology, and paleontology located throughout the buildings on campus. The Science Library was built south of Dawson Hall in 1968 to supplement the Science Center complex. Containing a thirteen-feet and over-2,500-pound skeleton of a giant North American ground sloth, a foyer connects the Science Library with the Boyd Graduate Studies Building also built in 1968. Named after U.S. Senator Paul D. Coverdell, the Paul D. Coverdell Center for Biomedical and Health Sciences is a $40-million facility with 172,180 square feet (16,000 m2) of space, giving enough room for about 275 scientists, staff and graduate students. The center was specifically designed to maximize energy efficiency and it was built with local and recycled materials. Laboratory intensive groups at the Coverdell Center include the Center for Tropical and Emerging Global Diseases, and the Biomedical Health Sciences Institute. The United States Congress and Georgia General Assembly each contributed $10 million to the construction of the building with the university raising the remaining $20 million from private donations. Former President George H.W. Bush spoke at the Center's grand opening in 2006. In 2016, the university also opened the Science Learning Center, a three-story 116,000-square-foot (10,800 m2) facility located near Stegeman Coliseum. The $44.7-million building has 33 instructional labs, two 280-seat lecture halls, and two additional 72-seat classrooms. The Driftmier Engineering Center, named after a campus engineer and the head of the former Agricultural Engineering Division of the College of Agriculture. Partnering with Roy Hitchcock, Rudolph H. Driftmier was responsible for the design and construction of 15 buildings on campus from 1930 to 1965. The 110,000-square-foot (10,000 m2) building renamed after Driftmier in 1982 was constructed in 1966 and is now home to the College of Engineering. The Georgia Center for Continuing Education & Hotel (formerly the Center for Continuing Education, Conference Center and Hotel) is also located on South Campus and is one of the busiest buildings on campus. The building hosts many seminars and conferences every year. The Georgia Center was built in 1957 with an initial $2 million grant from the Kellogg Foundation. In addition to hosting conferences, the Center offers adult education in face-to-face, blended, and online formats. The Center is also home to the WUGA, an affiliate of the National Public Radio. Bounded by Lumpkin Street to the west and East Campus Road to the east, Central Campus was developed on the remaining woodland area between the larger and older North and South Campuses. Development began in 1910 with Memorial Hall which remained unfinished until 1925 due to financial constraints. Originally envisioned as a student athletic facility and constructed with a swimming pool and gymnasium, Memorial Hall has served a wide variety of purposes before becoming home to the offices of the vice president of student affairs and several other administrative offices. Several former athletic facilities were located in this area before they were replaced by newer academic buildings, student life centers, and residence halls. Of these athletic facilities, only Sanford Stadium remains and continues to dominate Central Campus. Located in the northeast corner, the Fine Arts Building was modeled in the neoclassical architectural style and built in 1941 with funds from the Public Works Administration, part of the New Deal initiated in the 1930s. The building covers an area about the size of a city block, and the interior features a giant mural by French-American artist Jean Charlot. At the time of its construction, it was the largest and most expensive academic building on campus. The Zell B. Miller Learning Center became the largest academic building in Central Campus when it was built in 2003 with a footprint of 6.5 acres (2.6 hectares). With 26 classrooms and lecture halls and a total of 2,200 seats, the Learning Center is also "probably the most heavily used by students". In 2009, the building was renamed in honor of UGA alumnus Zell B. Miller who went on to serve as the 79th Governor of Georgia and later as the U.S. Senator from Georgia. Another heavily used building is the Dean Tate Student Center built in 1983 and expanded in 2009. The LEED Gold-certified building features a green roof and 75,000 gallon cistern to catch rainwater for use in irrigation and flushing toilets. The building was named after William Tate, the former dean of men. The Psychology-Journalism Building was built on grounds which formerly housed the university's tennis courts and gymnasium, Woodruff Hall. In 1967, a $6.1 million construction project created the building to house two of the largest departments at the university, the psychology department, part of the Franklin College of Arts and Sciences, and the Henry W. Grady College of Journalism and Mass Communication, named after the former editor of The Atlanta Constitution. Other buildings in the area include Clark Howell Hall, built in 1937 as a dormitory but which later became home to the UGA Career Center, and the UGA Bookstore built in 1968. Several residential halls are located in what is known as West Campus. It is made up of eight residence halls built in the 1960s and a pre-existing private residence hall, Oglethorpe House, which the university purchased in 1979. Lipscomb Hall, Mell Hall, Creswell Hall, Russell Hall, Brumby Hall, Hill Hall, Church Hall, and Boggs Hall are all named after former UGA presidents, deans, and administrators. Other notable buildings west of the campus include the Wray-Nicholson House, which was built in 1825, named after two businessmen who previously occupied the house and is now home to the UGA Alumni Association; The Richard B. Russell Jr. Special Collections Libraries Building, built in 2012, was named after the former Georgia governor and senator, and currently houses several archives and special collections. In 2013, the university began construction on Terry College of Business Complex. A total of six buildings were to be completed in a three-phase construction project. The first phase completed in 2015 led to the opening of Correll Hall. Phase II was completed in September 2017, opening Amos Hall, Benson Hall and Moore-Rooker Hall. All of the buildings were named after major contributors to the business school. Construction then began on the third phase of the project to include two more yet unnamed buildings. The newest addition to the campus, East Campus is demarcated by College Station Road to the south, East Campus Road to the west, River Road to the north and stretches to the Athens Perimeter or Loop 10 to the east. Its most northern building, the Performing Arts Center and its main concert hall, the 1,100-seat Hodgson Hall, has hosted the performances of notable orchestras such the Royal Philharmonic and the St. Petersburg Philharmonic, and regularly hosts seasonal performances by the Atlanta Symphony Orchestra. The center also holds the smaller Ramsey Hall which stages performances by solo and small chamber groups. East Campus is also home to the Georgia Museum of Art located just south of the Performing Arts Center. The museum's collection began with a donation of paintings by American artists from the art collector Alfred Heber Holbrook who developed a close friendship with the head of UGA Art Department, Lamar Dodd. Holbrook subsequently moved to Athens to become the museum's director, donated more than 900 works, and served as director for 25 years. In 1982, the Georgia General Assembly designated the museum as the official state museum of art. The current building in which the museum is located was built in 1996 and expanded in 2011. The building received a Gold LEED certification its "use of materials and construction strategies to achieve environmental sustainability." The Ramsey Student Physical Activities Center is located on East Campus. It was built in 1995 and named in honor of Eugenia A. and Bernard Ramsey. The building has a footprint larger than Sanford Stadium and is the largest single structure on UGA's campus. The Ramsey Center has two gyms, three pools (one Olympic-sized, a 17-foot (5.2 m) diving well, and a lap pool), a 1⁄8-mile (200 m) indoor suspended rubberized track, a 44-foot (13 m) high climbing wall, 14-foot (4.3 m) outdoor bouldering wall, ten racquetball courts, two squash courts, bicycle repair stands, eight full-length basketball courts, and 19,000 square feet (1,770 m2) of weight-training space. The Ramsey Center also contains the Gabrielsen Natatorium, home to the university's varsity swimming and diving programs. Located south of the Ramsey Center, the University Health Center provides health services to the university's student and faculty with a staff of more than 200 health professionals. The State Botanical Garden of Georgia is a 313-acre preserve set aside by the University of Georgia in 1968 for the study and enjoyment of plants and nature. Located three miles south of campus, it is a living laboratory serving educational, research, recreational, and public service roles for the University of Georgia. The garden contains a number of specialized theme gardens and collections, over five miles of nature trails, and four major facilities including a tropical conservatory. In 1984, the Georgia General Assembly designated the area as Georgia's official botanical garden. Delta Hall is the UGA facility in the Capitol Hill neighborhood on the east side of Stanton Park in Washington, D.C. The facility, which was purchased by the UGA Foundation in 2013, has undergone renovations to transform the 20,000-square-foot (1,900 m2) space to a residence hall and learning community. The renovated building provides living quarters, classroom and study space for University students and faculty who participate in UGA's experiential learning programs in the nation's capital including the Washington Semester Program. Oconee Forest Park, Lake Herrick and the Herrick Creek Loop are facilities for use and enjoyment of UGA students and staff. Named for Allyn M. Herrick, former Dean of the School of Forest Resources, Lake Herrick was commissioned by the School in 1982 as a recreational resource for UGA. Lake Herrick is a prominent feature within Oconee Forest Park that is a 60-acre natural area nestled behind the Intramural Fields. The area is popular for the recreational opportunities available throughout the Park and the adjacent Rec Sports Complex. Walking, trail running, birdwatching, and fishing are popular activities. An accessible dock is available for carry-in, non-motorized boats such as rowboats, canoes, kayaks and paddleboards. Herrick Creek Loop is a 1-mile loop trail that is good for all skill levels and primarily used for hiking, walking, and nature trips. Besides recreation, the area is used as a living laboratory for research and as an interdisciplinary outdoor classroom for faculty and students in visual arts, communication studies, ecology, engineering, forestry and natural resources, landscape architecture, and other fields. The 56-acre UGA Health Sciences Campus has an extensive landscaped green space with more than 400 trees and several historic buildings. The nearly 63,000 square-feet of building space on the new Health Sciences Campus include classrooms, rooms for small group and clinical skills teaching, lab space for gross anatomy, pathology and histology, a medical library, and faculty offices. The Medical Partnership administration is housed in Winnie Davis Hall which was built in 1902. UGA has facilities in almost every county in Georgia. The university has extended campuses in Atlanta and Gwinnett County, as well as Griffin and Tifton. The University of Georgia operates five 4-H centers around the state: Fortson 4-H Center, in the southern Atlanta metropolitan area, Jekyll Island 4-H Center and Tybee Island 4-H Center on the Georgia coast, Rock Eagle 4-H Center in Eatonton, and Wahsega 4-H Center in the North Georgia mountains. The university is also responsible for two other land holdings. These centers, operated in part by the University of Georgia College of Agricultural and Environmental Sciences, serve as educational facilitates for youth. Georgia 4-H specializes in educating young people about agricultural and environmental issues, agriculture awareness, leadership, communication skills, foods and nutrition, health, energy conservation, and citizenship. Built for $360,000 to replace the former Sanford Field in nearby Central Campus, Sanford Stadium was inaugurated on October 12, 1929 with a 15-0 victory over the Yale Bulldogs football team. Originally constructed to accommodate 30,000 fans, a double deck addition in 1967 added 19,000 more seats, and a 1981 addition to encircle the field added another 19,000 seats. After several more renovations, the stadium now holds more than 93,000 spectators, making it one of the largest collegiate stadiums in the country and the thirteenth largest stadium in the world. The stadium is named for Steadman Sanford, a former president of the university and chancellor of the University System of Georgia. Besides being the home of the Georgia Bulldogs football team, the stadium also serves as an event venue, the location of undergraduate graduation ceremonies, and was used for the medal competition of men's and women's Olympic football (soccer) at the 1996 Summer Olympics..
Stegeman Coliseum at UGA hosted 1996 Summer Olympics events. UGA's other athletic facilities are located in South Campus. The South Campus athletic complex consists of the Foley Baseball Field, Butts–Mehre Heritage Hall, Woodruff Practice Fields, (both used by the football team), William Porter Payne Indoor Athletic Facility (for indoor football and other sport practices), Stegeman Coliseum, the Coliseum Training Facility. and Spec Towns Track. Built in 1964, Stegeman Coliseum is the one of the oldest college basketball, gymnastics and volleyball venues in the South. Named after the former football coach Herman J. Stegeman and home to the Georgia Bulldogs basketball, Georgia Lady Bulldogs basketball, the women's gymnastics program, Georgia Gymdogs, and the women’s volleyball teams, Bulldogs Volleyball, the Coliseum has a seating capacity of 10,523. The basketball, volleyball, and gymnastics teams also have a practice facility in the adjacent Coliseum Training Facility. Stegeman Coliseum was the venue for the 1996 Summer Olympics Volleyball and Rhythmic Gymnastics, A large black marble Olympics Monument on the west lawn of Stegeman Coliseum, erected in preparation for the 1996 Summer Olympics, commemorates the more than 115 UGA students who participated in the Olympics, including Forrest "Spec" Towns. The Spec Towns Track located nearby was constructed in 1964 and is home to UGA's track and field teams. The Dan Magill Tennis Complex, located south of Stegeman Coliseum, includes sixteen tennis courts with seating for a total of about 5,000 spectators. The Carnegie Classification of Institutions of Higher Education characterizes the undergraduate admissions process at UGA as "more selective," its most selective admissions category, while the ACT Assessment Student Report places UGA student admissions in the "highly selective" category, the highest category. The Princeton Review places the university's average Admissions Selectivity Rating at 92 on 99-point scale. Incoming students include those from nearly every state and 47 countries around the world. The top states providing students are California, Florida, Georgia, Illinois, Maryland, New Jersey, New York, North Carolina, South Carolina, Tennessee, Texas, and Virginia. The university considers many factors when making admissions decisions including high school grades, specially considering the rigor of high school study, considers a student's studying in a school's "advanced" or "most difficult" curriculum, considers the taking of advanced placement, College Board Advanced Placement, International Baccalaureate, college enrollment and other rigorous classes, considers the scores on standardized tests (SAT or ACT), considers extracurricular activities, and considers personal statements. The overall average high school GPA of all enrolled first-year students was 4.07, first year students had taken an average of eight high school advanced placement courses, and more than 97% were in their school's "advanced" or "most difficult" curriculum. There were 26,448 applications for admission to the class of 2022 (enrolling fall 2018): 12,724 were admitted (48.1%) and 5,750 enrolled (an admissions yield of 45.2%) with more than 288 graduating first or second in their class and most within the top ten percent. The average SAT score for all admitted first-year students was 1400 out of 1600, and the average ACT Composite score was 31. For honors students, the average SAT scores was 1530 out of 1600 and the average ACT Composite score was 34. As of 2017[update], 24 UGA students have been named Rhodes Scholars including five since 2008. A student in 2016 became the seventh in UGA History to earn the Marshall Scholarship. In addition, there have been 53 Goldwater Scholars, 20 Truman Scholars, 16 Udall Scholars, 37 Boren Scholars, 112 Fulbright Scholars, three Schwarzman Scholars, three Mitchell Scholars, five Gates Cambridge Scholars, two Soros Fellows, a Beinecke Scholar, three Carnegie Endowment Gaither Fellows, and a MacArthur Fellow obtaining the "Genius Grant". U.S. News & World Report has ranked the university's undergraduate program as tied for 46th overall among National Universities and tied for 13th overall among Top Public National Universities in its 2019 rankings. The university is listed as a "Public Ivy" in Greene's Guides as "successfully competing with the Ivy League schools in academic rigor ... attracting superstar faculty and in competing for the best and brightest students of all races." The Princeton Review named the university as "Top 10 Best Value Public Colleges" which names UGA as one of the colleges designated as one of the best overall bargains based on cost and financial aid among the most academically outstanding colleges in the nation. In 2018, Kiplinger ranked the University 12th in its list of the "100 Best Values in Public Colleges." SmartMoney, a publication by The Wall Street Journal, named UGA as 4th best salary returns on tuition as of August 2018. In 2013, The Daily Beast named the university on its "Amazing but Overlooked: 25 Colleges You Haven't Considered But Should" listing. The American Council of Trustees and Alumni included the University of Georgia in its 2012 What Will They Learn? study, which is an annual evaluation system of colleges and universities. The report assigns a letter grade to 1,070 universities based on how many of the following seven core subjects are required: composition, literature, foreign language, American history, economics, mathematics and science. The University of Georgia was one of 21 schools to receive an "A" (the highest) grade, which is assigned to schools that include at least six of the seven designated subjects in their core curriculum. In 2018, American Association of Medical Colleges ranked UGA 9th in the entire nation among undergraduate institutions supplying white applicants to medical school, 22nd for the most African American applicants to medical school, and 31st for the most Asian applicants to medical school. The University of Georgia School of Public and International Affairs was ranked 4th in the nation, while the Public Management Administration program was ranked 1st by U.S. News & World Report in 2019. In 2019, the university's Terry College of Business risk management and insurance and real estate programs were ranked respectively 1st and 5th in the nation. The management information systems program was ranked 10th, while accounting program was ranked 12th in the nation. The general undergraduate program was ranked 24th, and the Terry College MBA program ranked 19th. Terry's undergraduate and masters accounting (MAcc) programs were each ranked 11th in the nation by Public Accounting Report. Businessweek named Terry's executive MBA program 14th in the nation. In 2019 ranking, the School of Environment and Design was ranked 1st among programs for undergraduates in the nation. According to the study by Law School Transparency, the University of Georgia School of Law is ranked in the top ten nationally for employment outcomes, while the law school has been ranked 13th of the top best law schools by the National Jurist. Georgia Law was ranked 27th of 206 American Bar Association (ABA) approved law schools in the 2019 edition of U.S. News & World Report rankings placing it in the top 13% of ABA law schools. The Law School has sent six clerks to serve justices of the United States Supreme Court in the last twelve years, is 4th among law schools for supplying these clerks for these prestigious Supreme Court positions from 2005 to 2017, and is 10th among all law schools in the country for the total number of federal court clerks accepted from Georgia Law. Based on outcome-driven factors such as average indebtedness, bar passage, and employment, Georgia Law has been ranked 1st as the best value in legal education in the entire United States by the National Jurist. The College of Veterinary Medicine was ranked 10th, and College of Pharmacy was ranked 25th in the 2019 edition of U.S. News & World Report rankings. Two UGA pharmacy students were selected for the U.S. Navy's Health Services Collegiate Program Medical Service Corps, a selective program that accepted only five recipients from applicants across the country. The University of Georgia's Office of International Education offers numerous study abroad destinations for a wide array of majors and areas of study. Destinations include, for example, Argentina, Belize, Brazil, Antarctica, Canada, China, Croatia, Czech Republic, Costa Rica, Ireland, Japan, South Korea, India, Finland, France, Germany, Ghana, Italy, New Zealand, Mexico, Poland, Puerto Rico, Russia, the Netherlands, Spain, South Africa, Tanzania, Turkey, and the United Kingdom. UGA is among the top-ranking American universities for the number of students studying abroad, with more than 100 programs in about 70 countries, and 25% of the student body participating in the program before graduation. UGA has faculty study abroad programs on every continent, including Antarctica. Additionally, UGA has signed agreements with several outside study abroad organizations: the American Institute For Foreign Study; GlobaLinks Learning Abroad; the Institute for Study Abroad (IFSA); International Studies Abroad (ISA); The School for Field Studies; the Innsbruck International Summer School. Just over 2,000 students, or 6% of the entire campus enrollment (graduate and undergraduate) study abroad in a given year. In the five years up to 2010, the number of students participating in study abroad programs has nearly doubled. Approximately 30% of the members of recent graduating classes had a study abroad experience. UGA students reside in Trinity College while at Oxford University. The university began its first year-round residential study-abroad program at Trinity College of Oxford University in England, where students and faculty live in a three-story Victorian house owned by UGA and located in the heart of the city of Oxford. Founded in 1987, the UGA at Oxford program began as a summer option and expanded to include spring in 1994. With the purchase of the house in 1999, the program became available throughout the academic year. The University of Georgia owns two other international residential centers: one in Cortona, Italy; the other, and UGA's largest, in Monteverde, Costa Rica. The UGA Costa Rica campus comprises 155 acres (0.63 km2) and over 36,000 square feet (3,300 m2) of built space nestled in the country's mountainous Monteverde Cloud Forest, a region that has been celebrated in publications such as Forbes Traveler, Newsweek, and National Geographic. Ever expanding its programmatic offerings, UGA Costa Rica annually offers 23 study abroad programs in 28 disciplines across the fall, spring, Maymester, Junemester, and summer terms. In 2012, the Certification for Sustainable Tourism (CST) program in Costa Rica recognized the University of Georgia's satellite campus in Costa Rica as one of its "Four Leaves" level institutions operating in the country. Run by the Costa Rican Tourism Board, the CST awards excellence in natural, cultural, and social resource management. To receive level four recognition, UGA Costa Rica scored better than 80 percent in all four categories related to sustainability: impact on the biological/physical surroundings; building and materials management; external client relations and outreach; and socio-economic impact on the local community. The University of Georgia has a nationally top-ten ranked, highest overall rated, and nationally acclaimed honors program. After gaining acceptance to the university, students must apply separately to the Honors Program and demonstrate significant additional academic achievement to be accepted. Foundation Fellows and the Ramsey Scholars programs are housed within the Honors program. In 2016, the average GPA of entering honors freshman was 4.2, the middle 50% range of SAT scores for admitted honors students was 2130–2240 out of 2400, and the middle 50% range of ACT Composite scores was 32-34. Through the Honors Program, students are able to participate in early registration for classes and register for special honors-only courses. Honors courses are taught by specially selected faculty with an average class size from 17-20 students, with many having significantly fewer students. Those wishing to graduate with High or Highest Honors must complete a capstone experience consisting of graduate courses, a senior thesis, or a special project prior to graduation. Honors students may elect to reside in the Myers Hall, which is reserved for honors students, or apply to reside in Rutherford Hall of the Franklin Residential College (FRC), a residential college based on the Oxford and Cambridge model. The program allows qualified undergraduates to pursue a curriculum leading to a bachelor's (AB/BS) and a master's (MA/MS) degree in four years. The Honors International Scholars Program (HISP) sets up honors students to study abroad on paid scholarship and internships. The Center for Undergraduate Research Opportunities (CURO), which is administered by the Honors Program, promotes opportunities for all undergraduate students at the University of Georgia to engage in research with premier research faculty regardless of discipline, major or GPA. CURO operates on the premise that it is possible for undergraduate students and faculty members to cooperatively engage in the creation of knowledge. Research faculty members who participate in CURO consider students partners in a learning community, and many students find they develop mentoring relationships focused on conducting research. Participating in undergraduate research contributes to the intellectual, professional, and personal growth of students. Through in-depth research with faculty members, students can explore questions and issues of interest as lines of inquiry develop through their undergraduate careers, earning academic credit in the process. The University of Georgia is classified in the highest ranking, "R-1: Doctoral Universities – Highest Research Activity" with "comprehensive" doctoral programs across the arts, sciences, engineering, law, and medicine according to the Carnegie Foundation for the Advancement of Teaching. According to the National Science Foundation, UGA research and development expenditures is among the top-6.7 percentile of American research universities with a budget of $455 million in 2017 and ranks 53rd among the more than 900 universities in the nation tracked by the foundation. More than 300 different products originating from UGA research are on the market. In 2012 Total Sponsored Awards regarding research totaled $234.88 million. The University of Georgia Research Foundation (UGARF) has over 1000 active licenses with technologies licensed in countries on all continents. In 2012, UGARF held more than 500 US and foreign patents. UGA ranked 2nd among all universities for most licenses and options executed in FY 2010 marking the fourth consecutive year that UGA has been ranked second. UGA also ranked 9th among all public universities for FY 2010 licensing income, and 18th of all universities, for total licensing revenue over the 3-year period (FY2008-2010) of $61.3 million. In November 2018, the University of Georgia launched a number of research initiatives funded by a $3 million NSF grant, including a project to transform the school's science education. The University also announced it will build a new Interdisciplinary Science, Technology, Engineering, Math (I-STEM) building that is expected to open in 2021. In addition, Georgia has research centers and institutes that include the following among many others. Founded in fall 2002, the institute is responsible for supporting campus-wide bioinformatics research at UGA. Institute members conduct bioinformatics research in a wide range of areas, ranging from structural genomics and bioinformatics, plant genomics, microbial genomics, biomedical and cancer bioinformatics and computational and statistical sciences for bioinformatics. The institute grants Ph.D. and M.S. degrees in bioinformatics as well as a graduate certificate in bioinformatics. In 2012, IOB Director Jessica Kissinger and IOB and Mathematics assistant professor Juan B. Gutierrez joined a collaborative effort on a malaria host-pathogen interaction research center that was awarded up to $19.4 million by a National Institutes of Health contract. The collaborative project is in conjunction with Emory University, Georgia Institute of Technology, Emory's Yerkes National Primate Research Center and the Centers for Disease Control and Prevention (CDC). University of Georgia dormitories on Sapelo Island. Sapelo Island, off the Georgia coast, is home to the University of Georgia Marine Institute, a nearshore ecological and geological research institute. The mission of the institute is to support and conduct research on coastal processes involving the unique ecosystems of coastlines. In 2012, UGA acquired the Skidaway Institute of Oceanography (SkIO), the marine science research institute that was founded in 1968, to join the University of Georgia Marine Institute that was founded in 1953. Coastal Plain Experiment Station in Tifton. The Coastal Plain Research Arboretum (38 acres (150,000 m2)) is an arboretum in Tifton, Georgia, located on the grounds of the Tifton Campus of the University of Georgia. The arboretum was established in 1987, with plant development and selection starting in 1991. It consists of stream-side forest and wetland, and is dedicated to native plant species of the Georgia coastal plain. The arboretum contains pine woods, a native azalea collection, and approximately 280 taxa of native trees, shrubs, and herbaceous plants. It is one of several institutions active in efforts to conserve the endangered Torreya taxifolia. The arboretum director is John M. Ruter, professor of horticulture at the university's Tifton campus. In 2010, the University of Georgia partnered with the Medical College of Georgia (MCG) at Augusta University (AU)(formerly Georgia Health Sciences University) to create a four-year medical education program in Athens providing for the granting of M.D. degrees at UGA to help alleviate a statewide shortage of physicians that exists in Georgia, as well as to increase research on disease prevention and treatment. The Augusta University's College of Nursing also has a satellite campus in Athens, and the UGA College of Pharmacy has a satellite campus in Augusta. First and second-year medical students at UGA study medical science and clinical skills in a program that parallels the Augusta curriculum of the Medical College of Georgia. Then third and fourth-year rotations are provided at area clinics and hospitals. In addition to increasing the number of physicians in Georgia, the partnership will expand research collaborations between MCG and UGA, creating new insights into the prevention and treatment of diseases such as diabetes, heart disease and cancer. Students from the MCG/University of Georgia Medical Partnership, graduate students from the University of Georgia College of Public Health, and visiting scholars reside on the University of Georgia's recently reacquired Health Sciences Campus in Athens. The Bioenergy Systems Research Institute conducts research in bioenergy that recognize the entire lifecycle and environmental impact of biomass production, harvesting, transport, treatment, conversion, and recycling. In 2013, the Institute received a $20,000,000 from the United States Department of Energy (DOE) Office of Energy Efficiency and Renewable Energy (EERE) and the Golden Field Office (GFO). The Institute was established to help bolster the University's research expenditure in environmental science. The 2013 SEC Academic Symposium, an academic conference-type event intended to address a scholarly issue in an area of strength represented by all SEC universities, was organized and led by the University of Georgia and the UGA Bioenergy Systems Research Institute in Atlanta, Georgia. The topic of the Symposium was titled, the "Impact of the Southeast in the World's Renewable Energy Future." The University of Georgia Small Satellite Research Laboratory (SSRL) was founded in 2016 by students with the help of researchers, scientists, and faculty associated the Center for Geospatial Research. The SSRL is funded by the NASA USIP (Undergraduate Student Instrument Project) to build a Cube Satellite for Low Earth Orbit. The SSRL is also part of the Air Force Research Laboratory's (AFRL) University Nanosatellite Program (UNP). The SSRL is student-led and will be building UGA's first satellite, a Cubesat, which will be sent to the International Space Station for deployment in late 2018. The University of Georgia has registered over 750 student organizations, academic associations, honor societies, cultural groups, sport teams, religious groups, publications, social groups and fraternities, volunteer and community service programs, and philanthropic groups that are all run by both graduate and undergraduate students and are integral parts of student life. Student organizations include, for example, the International Association of Business Communicators, the Democratic Party and Republican Party student groups, Arch Society, International Business Society, student philanthropies such as UGA Heros, Society for Management Information Systems, Alpha Phi Omega, UGA Habitat for Humanity, Society for Management Information Systems, UGA Miracle, The Professional Entertainment and Sports Association, Real Estate Society, Future Health Promoters at UGA, American Meteorological Society, Alpha Kappa Psi, International Relations and Leadership Opportunities, Environmental Health Sciences Club, Center for Leadership and Service, National Society of Leadership and Success, Phi Beta Lambda, Public Service and Outreach Student Scholars Program, School of Public and International Affairs Student Union, American Society for Microbiology Student Chapter, American Institute of Chemical Engineers, American Society of Biological Engineers, American Medical Student Association, American Society of Civil Engineers, H.O. Lund Entomology Club, Student Section of the American Society of Mechanical Engineers, Society of Entrepreneurs, Feeding Athens, Society of Automotive Engineers, American Meteorological Society, Georgia Students for Public Administration, International Student Life, CURE, The Society of Environmental Engineers, Center for Leadership and Service, Student Government Association, Omicron Delta Kappa, American Mock World Health Organization, Arts for the Cure, Exceptional Leaders Identifying the Talents of Everyone, Growth International Volunteer Excursions, Phi Beta Kappa, and UGA Relay for Life. In 2015 (the latest year), UGA was recognized by the President's Higher Education Community Service Honor Roll by the Corporation for National and Community Service. The honor is the highest federal recognition a college or university can receive for its commitment to volunteering, service-learning and civic engagement. The latest designation marks the 9th consecutive year UGA was named on the honor roll. Housing at the university is managed by the Department of University Housing. Student on-campus housing is divided into several communities: Brumby, Russell, Creswell, Hill, Myers, Reed, and the East Campus Village. Brumby, Creswell, and Russell halls are collectively known as the "freshman high-rises" due to their similarities in design and function. All three are located just off Baxter Street on West Campus. These are the biggest residence halls on campus and each house about 1,000 freshmen. The Hill community of residence halls consists of six building in West Campus near the freshman dorms. The community has a females-only residence (Hill Hall) and six coed residences: Boggs, Church, Lipscomb, Mell, and Oglethorpe Halls. The Myers community consists of four buildings in a quad located on South Campus. They are the coed residence halls Myers, Rutherford, and Mary Lyndon, along with Soule Hall which is reserved for female students. The Reed community is made up of four coed residence halls in North and Central Campus: Morris, Payne, Reed, and Building 1516. The East Campus Village consists of the apartment-style coed residences: Busbee, McWhorter, Rooker, and Vandiver. The University of Georgia maintains one of the South's oldest Greek systems, and the fraternity and sororities maintain homes both on and off campus. There are a number secret societies that exist at the university, such as Palladia and Gridiron. A group unique to UGA is the men's secret society known as the Order of the Greek Horsemen which annually inducts five fraternity men, all leaders of the Greek system. Its purpose and function remains a closely guarded secret. The Panhellenic sororities also have a secret society known as Trust of the Pearl, which inducts five accomplished sorority women each spring. The first Greek letter fraternity to charter at the university was Sigma Alpha Epsilon in 1865, and the first sorority was Phi Mu in 1921. There are 17 sororities from the Panhellenic Council, 26 North-American Interfraternity Conference fraternities, and 8 National Pan-Hellenic Council fraternities and sororities. Students with Greek affiliation made up 23 percent of the undergraduate student body as of 2007[update], including 21% of the males and 24% of the females. In the fall semester of 1997, six women started an Asian interest sorority at UGA, Alpha Sigma Rho, which would become the first in the state of Georgia. In 2000, Georgia Tech followed suit with the establishment of a chapter of Alpha Sigma Rho. In 2005 the university announced that five fraternities on Lumpkin Street would have to be relocated by June 2008. The university had planned to build additional academic buildings on the house sites, which the university owns and the fraternities lease. UGA offered to relocate the Lumpkin fraternities and two others to River Road (a former site of several fraternities who were moved out in the 1990s), located on East Campus. Kappa Alpha Order and Chi Phi did not take up the offer and decided to move off campus. Kappa Alpha Order moved to Hancock Street while Chi Phi built a house on Milledge Avenue. In October 2008, Pi Kappa Alpha, Phi Delta Theta, Tau Epsilon Phi and Sigma Nu broke ground for the new Greek Park located on River Road. The four new houses were completed in August 2009 for fall rush. Sigma Chi, having signed a renewable 40-year land lease with the University in 1996, continued to maintain their house next to the Zell B. Miller Learning Center. However, in fall of 2012, Sigma Chi's housing lease was up for negotiation with UGA administration. The fraternity's property was to be relocated off-campus to accommodate new academic buildings for the Terry College of Business. Construction of the new Business Learning Center began its planning phase in early 2013, ground was broken in December 2013, and its first phase was completed in July 2015. Construction for the third and final phase of the Business Learning Center is set to begin 2017 and complete in 2019. The University of Georgia Reserve Officer Training Corps (ROTC) is the official officer training and commissioning program at the university. Founded in 1801, it is one of the oldest such programs in the nation. The UGA ROTC "Bulldog Battalion" (Army) and UGA AFROTC "Flying Bulldogs" (Air Force) offer commissions for the United States Army into active duty service, into the Army Reserves or the Army National Guard, or into active service into the United States Air Force. The battalion is one of the oldest in the U.S. Memorial Hall was built with funds which Georgia alumni raised following World War I and was dedicated in 1924 to those who had given their lives the war. The Reserve Officer Training Corps offers training in the military sciences to students who desire to perform military service after they graduate. The Departments of the Army, and the Air Force each maintain an ROTC detachment on campus and each individual department has a full staff of military personnel. Executives of the University of Georgia's Student Government Association (SGA) make up the Student Advisory Council, which is composed of Student Government Presidents from every public college or university within the University System of Georgia. The Student Advisory Council is organized to advise the Georgia Board of Regents, through the Chancellor, on issues that are important to students. The Red & Black (R&B) is UGA's independent daily newspaper. Established in 1893 and independent of the university since 1980, The Red & Black is the largest college newspaper in Georgia and the 10th largest newspaper in the state of Georgia. Students published its first issue on November 24, 1893, from offices in the Academic Building on North Campus. The newspaper is operationally and financially independent from the university. The paper receives no student activity fees or other funding from UGA. The paper is self-sufficient through the sale of advertising making it one of the few student newspapers to do so. The Red & Black has won numerous awards nationally. In 2012, the Princeton Review named The Red & Black tenth among the nation's best student newspapers. R&B-TV is the photos and videos division of The Red & Black. R&B-TV publishes various videos relating to the University of Georgia and the community at large. WUGA-FM is the radio station run by students of the University of Georgia. Just before 6:00 a.m. on the morning of August 28, 1987, WUGA-FM signed on for its first day of broadcasting to Athens and the surrounding area. WUGA-FM broadcasts with 6000 watts in an "omni-directional pattern." WUGA-FM radio is the third most listened to station in Athens market out of 18 stations reported. It is the most listened to station for people with managerial, administrative or professional occupations. Launched in 2011, Ampersand Magazine is a UGA monthly publication catered to Athens residents. The magazine is a subsidized by The Red and Black. PreMed Magazine is a student organization that aims to help pre-medical students at the University of Georgia achieve success in the medical field. This club is open for students of all majors and concentrations. Topics range from student achievement in medicine and health science to recent innovations in biomedical sciences. Law students publish three legal journals: Georgia Law Review, the Journal of Intellectual Property Law, and the Georgia Journal of International and Comparative Law. In addition to the Georgia Law Review, students publish the online component, the Georgia Law Review Online, which features essays by practitioners, judges and professors focused primarily on timely legal issues in the U.S. Courts of Appeals. These journals have frequently been cited by federal and state courts, as well as textbooks and law reviews. Pandora is the yearbook of the university of Georgia. Beginning publication in 1886, Pandora has combined facts, photography, cartooning and humor to provide an annual record of University activities. Its serious and satirical articles both provide interesting historical details about student life on campus and in Athens. “The mission of the yearbook is to represent all aspects of student life at the University of Georgia and provide a record of the past, present, and future.” Further, the Pandora allows students to volunteer and gain valuable leadership, editing, writing, design, photography, and marketing experience. Finally, the Pandora student organization provides an award program for outstanding seniors through the Pandora Yearbook's Outstanding Senior Leaders program that honors senior students who have gone above and beyond in their commitment to academics, leadership, campus involvement, and community service. The College of Environment and Design building at the University of Georgia is a LEED certified structure that features 72 solar panels and water reclamation technology. In 2007, the Odum School of Ecology became the first-stand alone college or school within a university dedicated to the study of ecology and environmental science. The school was named after UGA professor and ecologist, Eugene Odum, who pioneered the modern study of ecology. The university has since made several advancements in sustainability. Under the UGA Facilities Management Division, the Office of Sustainability was initiated in 2010 as part of a strategic directive to enhance conservation of resources and long-term sustainability at the university. Through long-term environmental initiatives, under President Michael F. Adams the university established the office after support from students and faculty and residents of the Athens area. The Office of Sustainability's mission is to continue to improve environmental sustainability in many different areas on campus. The initiative was a result of a 2009 Report of the Working Group on Sustainability at the University of Georgia and the Green Initiative Fund (TGIF) student-led campaign. The Green Initiative Fund modeled their funding campaign after a similar campaign by students at the University of California-Berkeley. As of 2016[update], the Office of Sustainability has awarded a total of $170,000 to fund 47 student-initiated sustainability projects at UGA The Campus Sustainability Grants Program has helped foster several student initiatives, including water bottle refilling stations in the Zell B. Miller Learning Center, "Dawgs Ditch the Dumpster" residence hall move-out donation program, Tanyard Creek Chew Crew prescribed grazing project for invasive plant removal and Material Reuse Program, which uses salvaged items to construct school and community gardens. The university and Athens-Clarke County established a bicycle master plan to improve the mobility of students on campus while remaining environmentally consciousness. In 2009 the University of Georgia earned LEED certification from the U.S. Green Building Council with high marks for the expansion of the Tate Student Center. The renovated Tate Student Center became the sixth building on a university campus in the state of Georgia to be certified at the gold level and the second to be so designated in Athens. In 2012, Building 1516, a University housing complex constructed in 2010, became the first LEED-certified housing complex at the University of Georgia. In 2012, the College of Environmental Design's Visual Arts Building (now known as the Jackson Street Building) after a $9.9 million renovation became the first UGA building to incorporate a water reclamation system and the first to utilize solar harvesting technology through solar panels. In 2013 the university hosted the inaugural SEC Symposium in Atlanta. The topic is the Southeast's impact on the future of renewable energy, and the participants are the 14 universities of the SEC, as supported by its new academic initiative, SECU. In the same year, the university was named by the National Arbor Foundation as a designated Tree Campus USA for the third time in a row as a result of the university's continued commitment to maintaining and adding new foliage. UGA has more than 9,000 trees on campus, according to an ongoing tree-mapping project being conducted by the University Grounds Department. The number will continue to grow due to a partnership between Select Sustainable Tree Trust and UGA. In 2009, the Select Sustainable Tree Trust selected the university to receive a $1 million tree donation to "re-green" and impact the university campus with large-scale, sustainable shade trees. The first football squad at the University of Georgia in 1892. The University of Georgia varsity athletic teams participate in the NCAA's Division I FBS as a member of the Southeastern Conference. Since the 1997–1998 season, UGA has seven top ten rankings in the National Association of Collegiate Directors of Athletics (NACDA) Directors' Cup, a numerical ranking based on the success of universities in all varsity sports. The University has won national championships in football, women's gymnastics, women's equestrian (2003, 2004, 2008, 2009, 2010, 2014), baseball, tennis (men's and women's), golf (men's and women's), and women's swimming and diving. The Gym Dogs, the University's women's gymnastics team, have a NCAA-leading 10 national championships in gymnastics, including five consecutive championships from 2005 to 2009. The Bulldogs' most historic rivalry is with the nearby Georgia Tech Yellow Jackets. However, major rivalries have grown since, including the rivalry with the Florida Gators, and with the Auburn Tigers, referred to as the "Deep South's Oldest Rivalry" in reference to the first football game played between the two teams in 1892 and the more than one hundred meetings since. In 2011, Huffington Post named Florida–Georgia football rivalry one of college football's top 10 rivalries. The university also hosts several non-varsity sports, including wrestling, men's soccer, crew, ultimate frisbee, rugby, lacrosse, and ice hockey. Georgia's men's soccer team received a bid to play in the NIRSA Club National Championship for the first time in 2007. Despite the program's success, however, Title IX restrictions prevent the UGA men's team from competing on the varsity level as the women's is allowed to do. Similarly, University of Georgia men are not permitted to compete with a varsity gymnastics team, again due to Title IX restrictions. Several Varsity sports are duplicated with non-varsity teams, such as women's tennis. Georgia's men's lacrosse team has won the South Eastern Lacrosse Conference three times, in 1998, 2007, and 2008, and received an automatic bid to the Men's Collegiate Lacrosse Association national tournament; while the women's team earned an at-large bid to the WDIA National Tournament in 2007. The University of Georgia played an instrumental role in Atlanta's bid for the 1996 Summer Olympics. UGA conducted a majority of the preliminary studies for the economic impact of bringing the Olympic games to Atlanta, and hosted many Olympic events. In 1987, Atlanta attorney and former football player at the University of Georgia, William "Billy" Payne, conceived the idea of hosting the 1996 Summer Olympic Games. Atlanta mayor Andrew Young was among the first to join Payne in the quest to develop a bid and sell the proposal, first to local business leaders, then to the U.S. Olympic Committee, and finally to the members of the International Olympic Committee (IOC). The home of the Bulldogs hosted the medal round of the men's and women's Olympic soccer in July 1996. Sanford Stadium was temporarily converted into a soccer stadium which saw to the removal of the privet hedges surrounding the playing field. The hedges had been symbolic to UGA since the early 1930s. The hedges were restored after the Olympic games. In 1996, UGA's High Point was selected as the training site for the U.S. Dressage Team, which competed in the summer Olympic games at the International Horse Park in Conyers, Georgia. The University's basketball stadium, Stegeman Coliseum, was the venue for Volleyball and Rhythmic Gymnastics. Georgia's original colors included old gold, until the intense rivalry between Georgia Tech and Georgia around 1891 resulted in a skirmish over colors. Georgia students and alumni declared yellow an unfit color for the Georgia Bulldogs, deeming it a cowardly color. After the 1893 football game against Georgia Tech, University of Georgia President, Dr. Charles Herty, removed old gold as an official school color. Crimson (also referred to as "Good Old Georgia Red") and black have been the official colors ever since. The decision to include crimson red is also thought to be a tribute to the state of Georgia and a reminder of the University's flagship status. Kaolinite, commonly referred to as "Georgia red clay" is commonly found throughout the state, especially in the Red Hills Region. The red color that is so evident in Georgia soils is due primarily to iron oxides. The origin of the English Bulldog representing UGA, came from Yale University, with whom UGA had strong ties in its early years. Many early buildings and campus plans followed the layout of Yale. The bulldog mascot stems from University's founding father and first president, Abraham Baldwin, who was a graduate of Yale. The Bulldogs were thought to be a tribute to Baldwin's alma mater. The term "Georgia Bulldogs" was first coined on November 3, 1920 by Atlanta Journal Constitution writer Morgan Blake. After a 0-0 tie with University of Virginia in Charlottesville on November 6, 1920, Atlanta Constitution writer Cliff Wheatley used the name "Bulldogs" in his story five times. The name caught on and has been used ever since. Uga the Bulldog is the official live mascot of the Georgia Bulldogs. Uga is from a line owned by Frank W. (Sonny) Seiler of Savannah, Georgia since 1956. The current line began with Uga I, a solid white English Bulldog who was the grandson of a former Georgia mascot who made the trip to the 1943 Rose Bowl. Perhaps the most famous Uga was Uga V who made appearances in the movie Midnight in the Garden of Good and Evil. Uga V was also featured on the cover of the April 1997 edition of Sports Illustrated. Uga X became the mascot in 2015. Of course, although the University of Georgia is now known as the home of Uga, several mascots including other pure white English bulldogs led the Red and Black before Frank Seiler provided the current lineage. The University of Georgia is the only major college that buries its mascots within the confines of its stadium. Ugas I, II, III, IV, V, VI, VII and VIII are buried in marble vaults near the main gate in the embankment of the South stands of Sanford Stadium. Epitaphs to the dogs are inscribed in bronze, and before each home game, flowers are placed on their graves. The ringing of the Chapel Bell is a tradition held by students and alumni of the University of Georgia. The Chapel Bell is a historic monument and long-standing tradition of the University of Georgia. The Chapel Bell is located on the historic North Campus. Built in 1832, when Protestant orthodoxy dominated the campus region, the Chapel was a center of campus activities. A daily religious service, which students were required to attend, were held there, as were assemblies and commencements. The bell was also rung to mark the beginning and the end of class. Over the years, the Chapel Bell has served as an athletic tradition at the University of Georgia. The ringing of the Chapel Bell after a Georgia victory is a tradition that has endured since the 1890s. In Georgia football's early days, Herty Field was located only yards from the chapel, and first-year students were compelled to ring the bell until midnight in celebration of a Bulldog victory. Today, students, alumni, fans and townspeople still rush to the Chapel to ring the bell after a victory. The bell is also utilized for University meetings and events, weddings and remembrance ringing. The bell was rung in memory of victims of the September 11 attacks in 2001. After the 2012 Sandy Hook shooting, the University of Georgia partook in a nationwide mourning by ringing the Chapel Bell in honor of the victims of the shooting. On October 27, 2007, as tradition warrants, Georgia fans rang the Chapel Bell to celebrate the 42-30 win over archrival, the Florida Gators. The excitement caused the yoke holding the 877 lb. bell to give way, and it fell from the support platform. UGA Physical Plant has returned the bell to its historic post and as of November 2017[update] still rings daily across campus. January 27, 1785, is the date the University of Georgia became the first public university to have a charter granted. Each year, January 27 is commemorated to honor UGA's place in the history of American colleges and universities. The tradition began in 2002 and is now celebrated as Founders Week. During Founders Week, a series of celebrations are hosted by various campus departments including the Student Alumni Association and the Student Government Association. The Emeriti Scholars, a group of retired faculty members especially known for their teaching abilities and continued involvement in the university's academic life, sponsor the Founders Day Lecture. The lecture is held in the UGA Chapel and has become a Founders Day tradition, drawing alumni, students, faculty, esteemed guests and members of the community. In 1857, the University of Georgia constructed a cast iron representation of the architectural elements featured on the obverse of the Great Seal of the state of Georgia. It stands at the north entrance of the campus, and has become known as The Arch. Fashioned from existing material, The Arch is a representation but not an exact replica of the architectural elements of the Seal. Originally serving both symbolic and practical functions, it was connected to a barrier which kept cows from roaming over parts of the campus, and was initially known as The Gate. It serves as the official icon and a historic landmark for the university. Since the 1900s, tradition has held that students may not pass beneath the Arch until they have received a diploma from the University of Georgia. Those who walked under the Arch prior to graduation commencement were to said to never graduate. The tradition began when Daniel Huntley Redfearn, Class of 1910, arrived as a freshman from Boston, Georgia and vowed not to pass beneath the Arch until he had graduated. One of Redfearn's professors heard the vow and repeated it to his class, and the tradition has stood ever since. Many freshmen, learning of the tradition during orientation or from other sources still choose to honor the century-old tradition. Years of following the tradition are visible on the concrete steps leading to the Arch. Steps to each side have been worn down over the years as undergraduates have kept their vows. The Arch has been a site of historic political demonstrations. In 1961, when UGA officials desegregated the university with the admission of its first two African-American students, Hamilton Holmes and Charlayne Hunter-Gault. The Arch was a witness to students protesting both for and against segregation in the protesting the Persian Gulf War and a demonstration following the 1970 shootings at Kent State University. In 2001, along with the Chapel Bell, the Arch was the site of a memorial to the victims of the September 11 attacks. "Glory, Glory" is the rally song for the Georgia Bulldogs. "Glory, Glory" is sung to the tune of "The Battle Hymn of the Republic". It was sung at games as early as the 1890s, but arranged in its present form by Georgia's musician-composer Hugh Hodgson in 1915. There have been many Bulldog songs through the years and at least two collections dating back to 1909 have been published, but "Glory, Glory" has been the most accepted among students and alumni. The only known original reference to the piece is in a history of the Redcoat Band written in 1962, which briefly mentions the march as "Georgia's first original school song" and notes that "all copies of the work have been lost." The document is kept in the university's Hargrett Library for rare and historic documents. Although "Glory, Glory" is generally thought to be the school's fight song, the official fight song is "Hail to Georgia". The fight song is played by the Georgia Redcoat Marching Band after touchdowns, field goals, and extra points scored by the football team. The Georgia Redcoat Marching Band is a 375-member marching band. First directed in 1905 by R.E. Haughey, the band has only had seven directors. The "Alma Mater" is the official school song of the University of Georgia. Georgia's ‘’Alma Mater’’ is set to the tune of "Annie Lisle", a popular 1857 ballad by H. S. Thompson. Though the tune was not originally created as an alma mater rendition, the lyrics to Georgia’s ‘’Alma Mater’’ are unique to UGA, being penned by J.B. Wright, Jr., B.A.’12 and Gail Carter Dendy, B.A.’74, M.A.’81. The song is sung at commencement and various official events of the University of Georgia. Sanford Stadium is the on-campus playing venue for football at the University of Georgia in Athens. The 92,746-seat stadium is the seventh largest stadium in the National Collegiate Athletic Association. The stadium is the 8th largest non-racing stadium in the United States and the 14th largest such stadium in the world. The stadium played host to the Olympic medal competition of men's and women's Olympic football (soccer) at the 1996 Summer Olympics. The University of Georgia playing "Between the Hedges" is a reference to Sanford Stadium that dates back to the early 1930s. The famous Chinese privet hedges that surround Sanford's playing field were only one foot high when the stadium was dedicated in 1929 and were protected by a wooden fence. Sports writers, referring to an upcoming home game, were said to observe "that the Bulldogs will have their opponent "between the hedges." The phrase was coined by the Atlanta sportswriter Grantland Rice. Games played there are said to be played "Between the Hedges" due to the privet hedges, which had stood around the field since 1929, but removed in the summer of 1996 so that soccer could be played for the 1996 Summer Olympics; new, albeit considerably shorter, hedges were restored in the fall of 1996. The hedges have been dubbed Hedges II by UGA fans. The Dawg Walk is a Saturday football tradition and celebration at University of Georgia home games when UGA students and fans line up in the Tate Center parking lot to form a tunnel that greets the players and coaches as they enter Sanford Stadium. The team enters the stadium through Gate 10 at Sanford Stadium to the music of the Redcoat Marching Band. The march is often led by the team's costumed mascot Hairy Dawg. The Dawg Walk is preceded by two show section shows. The Redcoat Sousaphones perform a warm up concert in the Tate Center assembly area, while the Redcoat Drumline performs a drumshow in the parking lot. Twenty-five University of Georgia alumni have become state governors, including six of the last seven Governors of Georgia: George Busbee, Joe Frank Harris, Zell Miller, Roy Barnes, Sonny Perdue, and Brian Kemp. 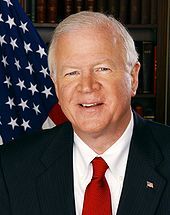 Miller also served as United States Senator as did several other UGA alumni including Johnny Isakson, and Saxby Chambliss. Other alumni who served in high levels of government included Lloyd D. Brown, an Army Major General who commanded the 28th Infantry Division in World War II, and Eugene E. Habiger, an Air Force four-star general who served as Commander-in-Chief of the United States Strategic Command from 1996 to 1998. University of Georgia alumni that pursued a career in investing and banking include Eugene R. Black Sr., the President of the World Bank from 1949 to 1963, and economist Robert D. McTeer, president of the Federal Reserve Bank of Dallas. Others in the business world include Bernard Ramsey, an executive with the brokerage firm Merrill Lynch, Daniel P. Amos, the chairman and CEO of Aflac, and Tom Cousins, a real estate developer, sports patron, and philanthropist. Cousins is the owner of the Atlanta Hawks. William Porter Payne, who played football at UGA, became president and chief executive officer of the Atlanta Committee for the Olympic Games and later chairman of Augusta National Golf Club. Payne was largely responsible for bringing the 1996 Summer Olympics to Atlanta and the University of Georgia. In sports, particularly in the NFL, a notable UGA alum is Terrell Davis, a two-time Super Bowl champion with the Denver Broncos who was inducted into the Pro Football Hall of Fame. Other Bulldogs that went on to a professional career include Hines Ward, a wide receiver who played the Pittsburgh Steelers for 15 seasons, Champ Bailey, a consensus All-American drafted by the Washington Redskins in the first round of the 1999 Draft, and Reggie Brown, drafted by the Philadelphia Eagles in the second round of the 2005 Draft. Alumni with careers in professional sports include Mitchell Boggs, a former baseball pitcher for the St. Louis Cardinals, and Kentavious Caldwell-Pope, a professional basketball player for the Los Angeles Lakers. UGA alumni have made significant contributions to the field of journalism and media. They include Henry W. Grady, a journalist and orator from the late 19th-century after whom the College of Journalism was named, and Clark Howell, a Pulitzer Prize-winning reporter who became the namesake of one of the buildings at his alma mater. Howell succeeded Grady as managing editor of the Atlanta Constitution. More recent journalism alumni include Charlayne Hunter-Gault, a former reporter for PBS NewsHour and CNN, Deborah Norville, an anchor for Inside Edition, and the ABC News television presenters Deborah Roberts and Amy Robach. Both Roberts and Robach appear on 20/20 and Good Morning America. A total of nine UGA graduates have received the Pulitzer Prize including Natasha Tretheway, winner of the 2007 Pulitzer Prize in Poetry who was appointed United States Poet Laureate in 2012 and again in 2014. Other notable UGA alumni in print media include Tom Johnson, a former publisher of the Los Angeles Times, and Stuart Woods, a prolific novelist with more than 60 books. Former UGA students in the music industry include Danger Mouse, Dave Haywood and Charles Kelley of Lady Antebellum, and several members of the bands The B-52's and R.E.M. After studying film at the university, Alton Brown became the director of photography on the music video for R.E.M.’s "The One I Love". Brown went on to create the Food Network television show Good Eats. Other notable alumni in film, television, and radio include Sonny Shroyer, Fred Newman, Matt Lanter, Kyle Chandler, IronE Singleton, Wayne Knight, and Ryan Seacrest. ^ As of June 30, 2017. "U.S. and Canadian Institutions Listed by Fiscal Year (FY) 2016 Endowment Market Value and Change in Endowment Market Value from FY 2016 to FY 2017". National Association of College and University Business Officers and Commonfund Institute. 2017. ^ Matheny, Martin (June 25, 2018). "Morris Named Interim UGA Provost". WUGA. Retrieved July 14, 2018. ^ a b c d e f "UGA by the Numbers". University of Georgia. Retrieved December 9, 2016. ^ "Color | Brand Toolkit | University of Georgia". Retrieved April 12, 2017. ^ "The Arch: Revitalized". University of Georgia. Retrieved September 10, 2016. ^ Georgia, Digital Library of (February 1, 2002). "History of the University of Georgia by Thomas Walter Reed". dlg.galileo.usg.edu. ^ "University of Georgia". New Georgia Encyclopedia. ^ "The Top American Research Universities 2017" (PDF). mup.umass.edu. The Center for Measuring University Performance University of Massachusetts Amherst. Retrieved February 6, 2019. ^ a b "The Carnegie Classification of Institutions of Higher Education – University of Georgia". Indiana University Center for Postsecondary Research. Retrieved November 2, 2016. ^ "Carnegie Classifications | Institution Profile". Carnegieclassifications.iu.edu. Retrieved August 12, 2015. ^ "Predictive Modeling Data in the ACT Electronic Student Record" (PDF). act.org. ACT, Inc. Retrieved March 18, 2019. ^ a b c d e Stirgus, Eric. "UGA Acceptance Getting Tougher". ajc.com. Cox Enterprises, Inc. Retrieved November 4, 2018. ^ "Best Undergraduate Teaching National Universities". usnews.com. U.S. News & World Report L.P. Retrieved February 6, 2019. ^ "University of Georgia Overall Rankings". colleges.usnews.rankingsandreviews.com/best-colleges. U. S. News & World Report, L.P. Retrieved September 21, 2016. ^ "UGA by the Numbers". UGA by the Numbers | University Of Georgia. Retrieved March 2, 2017. ^ "College Education | Scholarships | Admission | The Princeton Review". www.princetonreview.com. Retrieved March 2, 2017. ^ a b "UGA By the Numbers". University of Georgia. Retrieved November 18, 2012. 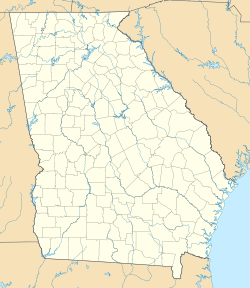 ^ "GEORGIA – Clarke County". National Registrar of Historic Places. Retrieved April 10, 2013. ^ Newman, Liz (October 23, 2014). "14 reasons Athens, GA is the best college town in America". ^ a b Asher, Beckner. "Joining UGA organizations allows students to find their passions". redandblack.com. RedAndBlack.com. Retrieved March 24, 2019. ^ "Involvement Network Organizations". uga.campuslabs.com. Campus Labs. Retrieved March 24, 2019. ^ "NCAA/SEC Championships". georgiadogs.com. University of Georgia Athletics. Retrieved March 24, 2019. ^ "Olympic Bulldogs". georgiadogs.com. University of Georgia Athletics. Retrieved March 24, 2019. United States Congress. "University of Georgia (id: H000061)". Biographical Directory of the United States Congress. Retrieved August 23, 2018. ^ Rosen, George (April 1976). "Benjamin Rush on Health and the American Revolution". American Journal of Public Health. 66 (4): 397–398. doi:10.2105/ajph.66.4.397. PMC 1653277. Retrieved May 24, 2016. ^ a b c d Knight, Lucian Lamar (1913). "Franklin College: The Oldest State University in America, Chartered in 1785". Georgia's Landmarks, Memorials, and Legends... pp. 139–45. ^ a b Boney, F. N. (2000). A Pictorial History of the University of Georgia. University of Georgia Press. p. 2. ISBN 978-0-8203-2198-1. ^ Thelin, John R. (May 3, 2004). A History of American Higher Education. JHU Press. p. 45. ISBN 978-0-8018-7855-8. ^ Smith, Gerald J. "Abraham Baldwin (1754–1807)". georgiaencyclopedia.org. a program of Georgia Humanities. Retrieved January 17, 2019. ^ Dendy, Larry B. (2013). Through the Arch: An Illustrated Guide to the University of Georgia Campus. University of Georgia Press. p. 2. ISBN 978-0-8203-4248-1. ^ Hynds, Ernest C. (August 1, 2009). Antebellum Athens and Clarke County, Georgia. University of Georgia Press. pp. 3–4. ISBN 978-0-8203-3446-2. ^ Glier, Ray (September 25, 2012). How the SEC Became Goliath: The Making of College Football's Most Dominant Conference. Simon and Schuster. p. 23. ISBN 978-1-4767-0328-2. ^ Scott, Richard (September 15, 2008). SEC Football: 75 Years of Pride and Passion. Voyageur Press. p. 16. ISBN 978-1-61673-133-5. ^ Thelin, John R. (June 1, 2011). Games Colleges Play: Scandal and Reform in Intercollegiate Athletics. JHU Press. Chapter 2. ISBN 978-1-4214-0391-5. ^ Cook, James F (2002). "Cocking Affair". New Georgia Encyclopedia. Georgia Humanities Council and University of Georgia Press. Retrieved December 23, 2010. ^ a b Van Gelder, Lawrence. "Hamilton E. Holmes Dies at 54". nytimes.com. The New York Times Company. Retrieved January 3, 2019. ^ Dyer, Thomas G. (December 1, 1985). The University of Georgia: A Bicentennial History, 1785–1985. University of Georgia Press. p. 357. ISBN 978-0-8203-2398-5. ^ "Jan Kemp and the Georgia Judgement". Washington Post. February 15, 1986. Retrieved July 16, 2018. ^ Forde, Pat (December 11, 2008). "Forde: Death of a college football whistle-blower". ESPN. Retrieved July 16, 2018. ^ Goldstein, Richard (December 11, 2008). "Jan Kemp Dies at 59; Exposed Fraud in Grades of Players". The New York Times. Retrieved July 16, 2018. ^ a b Shearer, Lee (February 28, 2018). "Morehead: UGA running out of research space". Athens Banner-Herald. Retrieved July 18, 2018. ^ a b Eldridge, Ellen (November 20, 2016). "UGA economics and religion major named 2017 Rhodes Scholar". Atlanta Journal-Constitution. Retrieved July 18, 2018. ^ "Open Doors Report on International Education Exchange: Leading Institutions". Institute of International Education. 2017. Retrieved July 18, 2018. ^ Shearer, Lee (April 27, 2017). "UGA raises will average 2.5 percent this year, university President Jere Morehead says". Athens Banner-Herald. Retrieved July 18, 2018. ^ Shearer, Lee (September 15, 2017). "UGA dedicates second phase of new business school complex". Athens Banner-Herald. Retrieved July 18, 2018. ^ "Fast Facts". UGA Undergraduate Admissions. Retrieved November 2, 2016. ^ a b c d e f "First-Year Class Profile". admissios.uga.edu. University of Georgia. Retrieved February 6, 2019. ^ "Tuition and Costs of Attending UGA". University of Georgia. ^ "UGA by the Numbers". www.uga.edu. University of Georgia. Retrieved December 9, 2016. ^ Eliscu, Jenny (August 11, 2005). "Top Ten Schools that Rock". Rolling Stone. Retrieved November 14, 2018. ^ "The 16 Best Places to Live in the U.S.: 2015". Outside. August 18, 2015. Retrieved November 14, 2018. ^ Clanton, Nancy (August 25, 2015). "One of America's 'best places to live' is only an hour away". The Atlanta Journal-Constitution. Retrieved November 14, 2018. ^ Smith, Jennifer Chappell (August 16, 2017). "The South's Most Beautiful Colleges". Southern Living. Retrieved November 14, 2018. ^ a b Dendy 2013, p. ix-xi. "Forward by F. N. Boney"
^ Vejnoska, Jill (March 28, 2018). "Garden clubs: A serious force in Georgia and throughout nation". The Atlanta Journal-Constitution. Retrieved November 17, 2018. ^ "State Seal". Georgia Secretary of State. Archived from the original on September 5, 2008. Retrieved January 25, 2008. ^ Shearer, Lee (February 23, 2012). "Researcher works on dog vaccine to save human lives". Athens Banner-Herald. Retrieved December 23, 2018. ^ Beeson, Leigh (March 15, 2018). "UGA researchers battle neglected diseases". Athens Banner-Herald. Retrieved December 23, 2018. ^ Shearer, Lee (July 30, 2016). "UGA's new Science Learning Center will open as classes begin Aug. 11". Athens Banner-Herald. Retrieved December 23, 2018. ^ Staff Reports (January 8, 2013). "Atlanta co. picked to build on to UGA biz school". Athens Banner-Herald. Retrieved December 30, 2018. ^ a b Staff Reports (May 13, 2017). "Two UGA Business Learning Community buildings named for donors". Athens Banner-Herald. Retrieved December 30, 2018. ^ a b Shearer, Lee (September 15, 2017). "UGA dedicates second phase of new business school complex". Athens Banner-Herald. Retrieved December 30, 2018. ^ "UGA RecSports Guide" (PDF). Department of Recreational Sports. University of Georgia. Archived from the original (PDF) on January 12, 2011. Retrieved August 12, 2015. ^ Caldwell, Carla (February 26, 2015). "UGA program in Washington, D.C., funded by $5M Delta Air Lines grant". Atlanta Business Chronicle. Retrieved January 8, 2019. ^ "Lake Allyn M. Herrick reopened for recreational boating on Wednesday, October 17, 2018". sustainability.uga.edu. University of Georgia. Retrieved February 6, 2019. ^ "Lake Herrick and Herrick Creek Loop". alltrails.com. AllTrails, Inc. Retrieved February 6, 2019. ^ "UGA-GHSU Medical Partnership: About Us". UGA-GHSU. Retrieved November 19, 2012. ^ Copeland, Eve (August 25, 2018). "UGA-Tifton celebrates 100 years of research". The Tifton Gazette. Retrieved January 8, 2019. ^ "College of Agricultural and Environmental Sciences Georgia 4-H Facilities". Georgia 4-H. Retrieved January 12, 2013. ^ "About Georgia 4-H". Georgia 4H. Archived from the original on January 29, 2013. Retrieved January 12, 2013. ^ 1996 Summer Olympics official report. Volume 3. p. 455. ^ "Georgia to name indoor practice facility after Billy Payne". ajc.com. Atlanta Journal-Constitution / Cox Media Group. Retrieved April 18, 2019. ^ "Finding Aid for The 1996 Atlanta Olympic Games at the University of Georgia Collected Papers 1984–2009". UGA Libraries. Retrieved February 24, 2013. ^ "University of Georgia". princetonreview.com. TPR Education IP Holdings, LLC. Retrieved November 5, 2017. ^ Stirgus, Eric. "Raising black student enrollment at UGA still a challenge". ajc.com. Cox Media Group. Retrieved April 26, 2018. ^ a b "Admissions-First-Year Class Profile". UGA Undergraduate Admissions. Retrieved November 2, 2016. ^ "Number of Winners by Institution: U.S. Rhodes Scholars 1904–2019" (PDF). Office of the American Secretary of The Rhodes Trust. 2019. Retrieved February 15, 2019. ^ "UGA Honors Program – External Scholarships". The University of Georgia. Retrieved November 23, 2016. ^ "RECENT GRADUATE SCHOLARSHIP RECIPIENTS". honor.uga.edu. Honors Program - EXTERNAL SCHOLARSHIPS. Retrieved April 18, 2019. ^ "University of Georgia – U.S. News Best Grad School Rankings". U.S. News & World Report. Retrieved September 10, 2018. ^ "University of Georgia – U.S. News Best Global University Rankings". U.S. News & World Report. Retrieved September 10, 2018. ^ a b c "U.S. News Best Colleges Rankings – University of Georgia". U.S. News & World Report. Retrieved September 10, 2018. ^ "University of Georgia". Princeton Review. Retrieved December 7, 2012. ^ "Best Values in Colleges – University of Georgia". Kiplinger. The Kiplinger Washington Editors. 2017. Retrieved February 15, 2019. ^ De Vise, Daniel (August 12, 2011). "SmartMoney College Rankings". The Washington Post. Retrieved February 15, 2011. ^ "Amazing but Overlooked: 25 Colleges You Haven't Considered but Should". The Daily Beast. October 16, 2013. Retrieved March 1, 2013. ^ Czupor, Z.J. (October 11, 2012). "National study ranks Colorado Christian in top 2% of colleges". Denver Post. Archived from the original on February 15, 2013. Retrieved January 11, 2013. ^ "Table 2: Undergraduate Institutions Supplying Applicants to U.S. Medical Schools by Applicant Race and Ethnicity, 2011". AAMC Databook. American Association of Medical Colleges. Archived from the original on September 8, 2012. Retrieved November 18, 2012. ^ "Terry College of Business" (PDF). About UGA. University of Georgia. Retrieved September 8, 2016. ^ "Current Rankings". Terry College of Business. Archived from the original on March 4, 2013. Retrieved March 1, 2013. ^ "America's Best Landscape Architecture Schools 2015". DesignIntelligence. December 5, 2014. Retrieved February 15, 2019. ^ "LST Reports - National Report". lstreports.com. Law School Transparency. Retrieved March 2, 2019. ^ "Best Law Schools Revisited". nxtbook.com. The National Jurist. Retrieved April 7, 2017. ^ "Best Law Schools Ranked in 2017". US News. Retrieved April 22, 2017. ^ Rice, Cindy. "Sixth UGA School of Law grad selected to clerk for U.S. Supreme Court". news.uga.edu. University of Georgia. Retrieved July 28, 2016. ^ Mauro, Tony. "SCOTUS Clerks: The Law School Pipeline". law.com. ALM Media Properties, LLC. Retrieved November 4, 2018. ^ Morse, Robert (June 12, 2014). "Grads of These Law Schools Get the Most Judicial Clerkships". U.S. News & World Report. Retrieved July 28, 2016. ^ Murphy, Heidi. "UGA School of Law named best in nation for return on investment". law.uga.edu. University of Georgia School of Law. Retrieved December 22, 2018. ^ "UGA pharmacy students selected for Navy's Health Services Collegiate Program". UGA Today. Retrieved February 24, 2013. ^ "UGA Study Abroad". University of Georgia. Archived from the original on May 18, 2013. Retrieved November 20, 2012. ^ "Study Abroad". uga.edu. Archived from the original on August 20, 2010. Retrieved December 3, 2010. ^ "Study Abroad Risk Management Training". uga.edu. Archived from the original on December 6, 2010. Retrieved December 3, 2010. ^ Bolton, Phil (July 4, 2016). "UGA Study-Abroad Students Arrive in Oxford at a Historic Moment in U.K.-EU Relations". Global Atlanta. Retrieved February 15, 2019. ^ "Costa Rican President Visits Local UGA Campus". Global Atlanta. February 13, 2013. Retrieved February 15, 2019. ^ "UGA Costa Rica receives sustainability award". UGA Today. University of Georgia. Retrieved November 19, 2012. ^ "Top Honors Programs-Updated for 2016!". Public University Honors. Retrieved October 16, 2016. ^ "Top Honors Programs-Updated for 2016!". www.publicuniversityhonors.com. Public University Honors. Retrieved December 10, 2016. ^ a b c "Why Honors?". UGA Honors. Retrieved February 10, 2013. ^ "Honors International Scholars". UGA Honors. Retrieved February 10, 2013. ^ Shearer, Lee (April 9, 2018). "UGA undergraduates display their research in CURO Symposium". Athens Banner-Herald. Retrieved February 15, 2019. ^ Schupska, Stephanie (October 6, 2018). "UGA recognizes 11 new CURO Honors Scholars". Athens Banner-Herald. Retrieved February 15, 2019. ^ "The Carnegie Classification of Institutions of Higher Education". Carnegie Foundation. Retrieved November 19, 2012. ^ "Rankings by total R&D expenditures". National Science Foundation. 2017. Retrieved March 22, 2019. ^ "UGA Research Fast Facts". University of Georgia. Archived from the original on October 28, 2012. Retrieved November 19, 2012. ^ Fahmy, Sam (November 28, 2018). "UGA launches project to transform STEM education". Athens Banner-Herald. Retrieved March 22, 2019. ^ Shearer, Lee (November 28, 2018). "UGA breaks ground for new science building". Athens Banner-Herald. Retrieved March 22, 2019. ^ "Research". research.uga.edu. University of Georgia. Retrieved April 2, 2017. ^ "Centers & Institutes". research.uga.edu. University of Georgia. Retrieved April 2, 2017. ^ "A Brief History of IOB". UGA IOB. Retrieved January 12, 2013. ^ "Applications for Admission to the Bioinformatics Program". UGA IOB. Retrieved January 12, 2013. ^ "UGA partners with Emory, GA Tech and CDC on malaria systems biology research center". UGA IOB. Archived from the original on February 10, 2013. Retrieved January 12, 2013. ^ "University of Georgia Marine Institute". Archived from the original on July 6, 2014. Retrieved September 22, 2014. ^ "Skidaway Institute to Become a Part of UGA". Online Athens. Retrieved November 19, 2012. ^ John M. Ruter, Development of New Ornamental Plants at the University of Georgia Tifton Campus Archived October 28, 2011, at the Wayback Machine, METRIA 2002: Landscape Plant Symposium: Plant Development and Utilization, Program and Selected Papers. Asheville, North Carolina. May 23–25, 2002. ^ "Medical Partnership: About us". GRU-UGA Medical Partnership. Retrieved February 6, 2015. ^ "About us". UGA Bioenergy. Archived from the original on July 29, 2013. Retrieved February 13, 2013. ^ "Funding". UGA Bioenergy. Archived from the original on July 29, 2013. Retrieved February 13, 2013. ^ "UGA Today". University of Georgia. Retrieved February 13, 2013. ^ "NASA Selects Proposals for Student Flight Research Opportunities". NASA. Retrieved May 5, 2016. ^ "UGA team selected by NASA, Air Force to build and launch two cube satellites". UGA. Retrieved May 8, 2016. ^ Hammel, John (January 9, 2017). "Small Satellite Research Laboratory seeks students passionate about space". The Red and Black. Retrieved March 22, 2019. ^ "University of Georgia". Collegeboard. Archived from the original on September 9, 2012. Retrieved September 10, 2018. ^ "Quickfacts". US Census. Retrieved December 29, 2013. ^ "Center for Student Activities and Involvement". uga.campuslabs.com. Campus Labs. Retrieved March 24, 2019. ^ "UGA STUDENT ORGANIZATIONS". thegeorgiaway.com. University of Georgia Athletic Association. Retrieved March 24, 2019. ^ "Organizations". uga.campuslabs.com. Campus Labs. Retrieved March 24, 2019. ^ "UGArelay.org". UGArelay.org. Retrieved December 8, 2012. ^ "UGAheros.org". UGAheros.org. Retrieved December 8, 2012. ^ "UGA earns recognition for community service projects". OnlineAthens. Retrieved April 3, 2013. ^ "2015 HONOR ROLL GENERAL CATEGORY" (PDF). nationalservice.gov. Corporation for National and Community Service. Retrieved January 4, 2019. ^ a b c d e "University Housing". The University of Georgia. Archived from the original on November 25, 2018. Retrieved March 23, 2019. ^ Styrdom, Lara (October 26, 2017). "Tricks, treats and tradition: Resident halls host 'Haunted High-Rises'". The Red and Black. Retrieved March 23, 2019. ^ "Housing - Community Page - Reed". housing.uga.edu. The University of Georgia. Retrieved March 23, 2019. ^ "Chapters & Colonies". Alpha Sigma Rho. Archived from the original on January 26, 2012. Retrieved February 23, 2013. ^ Joe Mason (November 1, 2006). "Frats question building costs". The Red and Black. Archived from the original on January 25, 2012. Retrieved December 8, 2012. ^ "UGA in talks to buy out Sigma Chi's lease". Red & Black. Retrieved February 23, 2013. ^ "Business Learning Community – Terry College of Business – University of Georgia". building.terry.uga.edu. ^ a b "Battalion History". University of Georgia ROTC. Retrieved May 3, 2013. ^ "Freshman Programs". UGA SGA. Retrieved January 6, 2013. ^ "About us". Red & Black. Archived from the original on February 22, 2013. Retrieved February 9, 2013. ^ "Princeton Review's 'Best College Newspapers' list". Poynter.rog. Archived from the original on February 19, 2013. Retrieved February 9, 2013. ^ "R&B-TV: Videos". The Red & Black. Archived from the original on February 22, 2013. Retrieved February 9, 2013. ^ "WUGA: A Tale of a Radio Station". WUGA's 10th Anniversary program guide, August 1997. WUGA. Archived from the original on March 26, 2014. Retrieved February 9, 2013. ^ "About WUGA". WUGA.org. Archived from the original on February 17, 2013. Retrieved February 9, 2013. ^ "Ampersand". The Red & Black. Archived from the original on March 12, 2013. Retrieved February 27, 2013. ^ "About". Pre-Med Magazine at UGA. Archived from the original on May 30, 2013. Retrieved May 3, 2013. ^ "Journals". University of Georgia. Retrieved April 24, 2016. ^ "Official Yearbook Pandora 1886". pandorayearbook.com. The University of Georgia. Retrieved January 3, 2019. ^ "Pandora: Yearbook of the University of Georgia from the Hargrett Rare Book and Manuscript Library". galileo.usg.edu. Galileo Scholar. Retrieved January 3, 2019. ^ Schroeder, Paul A. (June 30, 2018). Clays in the Critical Zone. Cambridge University Press. p. 44. ISBN 978-1-108-69185-7. ^ Housel, Debra J. (2009). Ecologists: From Woodward to Miranda. Capstone. pp. 20–23. ISBN 978-0-7565-4076-0. ^ Shearer, Lee (July 13, 2016). "Six years on, UGArden thriving, making friends for UGA and feeding people". Athens Banner-Herald. Retrieved February 15, 2019. ^ a b Service, UGA News (January 11, 2016). "University's Office of Sustainability awards grants to fund student projects". Athens Banner-Herald. Retrieved February 15, 2019. ^ "History". Office of Sustainability. Retrieved February 9, 2013. ^ "UGA awards sustainability grants to seven student projects". UGA Today. Retrieved February 9, 2013. ^ "Bicycle Facility Study" (PDF). UGA Architects. Archived from the original (PDF) on October 15, 2012. Retrieved February 9, 2013. ^ Pharr, Kathy (November 23, 2009). "University of Georgia earns LEED Certification". UGA Today. Retrieved February 9, 2013. ^ Coley, Tracy (March 7, 2012). "UGA residence hall Building 1516 receives honors". UGA Today. Retrieved February 15, 2019. ^ Kazmierczak, Jeanette (February 5, 2013). "Green between the hedges: UGA hosts SEC sustainability symposium". Red & Black. Retrieved February 9, 2013. ^ Schupska, Stephanie (March 21, 2012). "UGA receives second Tree Campus USA designation from Arbor Day Foundation". Athens Banner-Herald. Retrieved February 15, 2019. ^ Schupska, Stephanie (February 1, 2013). "Arbor Day Foundation gives UGA its third Tree Campus USA designation". UGA Today. Retrieved February 15, 2019. ^ "Select Sustainable Tree Trust to donate $1 million". UGA Today. Retrieved February 24, 2013. ^ "National Association of Collegiate Directors of Athletics – Directors Cup". Archived from the original on February 7, 2009. Retrieved May 25, 2006. ^ Harrington, Rebecca (September 1, 2011). "The 10 Best College Rivalries". Huffington Post. Retrieved November 19, 2012. ^ "UGA Wrestling". Wrestling.uga.edu. Retrieved August 12, 2015. ^ "The University of Georgia Rowing Club". ^ "Jojah Intro". Uga.edu. Archived from the original on May 27, 2010. Retrieved December 3, 2010. ^ "The Economic Impact on the State of Georgia of Hosting the 1996 Summer Olympic Games" (PDF). Selig Center for Economic Growth. The University of Georgia's Terry College of Business. Archived from the original (PDF) on March 19, 2013. Retrieved February 24, 2013. ^ "1996 Olympic Games". Georgia Encyclopedia. Retrieved February 24, 2013. ^ "UGA Equestrian Complex". NMN Athletics. Retrieved February 24, 2013. ^ "Origins of SEC School Colors". SEC Sports Fan. Retrieved February 9, 2013. ^ "Georgia Traditions". UGA's GeorgiaDogs.com. Archived from the original on January 18, 2013. Retrieved February 9, 2013. ^ a b "Georgia Traditions". UGA's Georgiadogs. Archived from the original on January 18, 2013. Retrieved February 9, 2013. ^ "Sports Illustrated cover page". SportsIllustrated. Retrieved February 9, 2013. ^ "History of Uga". www.georgiadogs.com. CBS Interactive. Retrieved March 26, 2017. ^ "History of the Chapel". University of Georgia. Archived from the original on August 21, 2006. Retrieved February 9, 2013. ^ "Bells will ring in Athens, across U.S., for Conn. shooting victims". OnlineAthens. Retrieved February 24, 2013. ^ "Glory, glory, old march discovered". University of Georgia. Archived from the original on May 18, 2013. Retrieved February 9, 2013. ^ "HISTORY & TRADITIONS – SINGING OF THE ALMA MATER". commencement.uga.edu. uga.edu. Retrieved January 17, 2019. ^ "Georgia Traditions". Georgia Dogs. Archived from the original on January 18, 2013. Retrieved December 2, 2012. ^ "Ranking the 5 All-Time Greatest Traditions in Georgia Bulldogs Football History". Bleacher Report. Retrieved February 9, 2013. ^ "Ranking the 5 All-Time Greatest Traditions in Georgia Bulldogs Football History". BleacherReport. Retrieved February 9, 2013. ^ "Notable Alumni". UGA Alumni Association. Retrieved March 6, 2019. ^ Deal, Sandra D.; Dickey, Jennifer W.; Lewis, Catherine M. (October 2015). Memories of the Mansion: The Story of Georgia’s Governor’s Mansion. University of Georgia Press. ISBN 978-0-8203-4859-9. ^ a b Hendrix, Steve (October 17, 2002). "Mountain to Hill". The Washington Post. Retrieved March 6, 2019. ^ Whitt, Rich (August 2011). Behind the Hedges: Big Money and Power Politics at the University of Georgia. NewSouth Books. p. 24. ISBN 978-1-60306-096-7. ^ Salzer, James; Bluestein, Greg; McCaffrey, Shannon (January 19, 2017). "Trump taps Perdue as agriculture chief". The Atlanta Journal-Constitution. Retrieved March 6, 2019. ^ Brett, Jennifer (October 12, 2018). "'Solid': Republican Brian Kemp plays up rural roots, business bonafides". The Atlanta Journal-Constitution. Retrieved March 6, 2019. ^ Schupska, Stephanie (March 20, 2014). "Johnny Isakson to deliver UGA's spring commencement address". UGA Today. Retrieved March 6, 2019. ^ "UGA Alumni Association to present annual awards during Friday luncheon". Athens Banner-Herald. April 14, 2016. Retrieved March 6, 2019. ^ Greenwood, John (September 26, 2008). Normandy to Victory: The War Diary of General Courtney H. Hodges and the First U.S. Army. University Press of Kentucky. ISBN 978-0-8131-2642-5. ^ Congressional Record: Proceedings and Debates of the 107th Congress Second Session. Volume 144 Part 8. Government Printing Office. 1998. p. 12230. ^ "Eugene Robert Black". World Bank. Retrieved March 6, 2019. ^ "Baltimore Regulator Named to Head Fed Bank in Dallas". The Washington Post. September 5, 1990. Retrieved March 6, 2019. ^ Williams, Dave (February 12, 2019). "$3M donation to UGA law school targets first-generation students". Atlanta Business Chronicle. Retrieved March 6, 2019. ^ Miller, Rex; Latham, Bill; Cahill, Brian (November 7, 2016). Humanizing the Education Machine: How to Create Schools That Turn Disengaged Kids Into Inspired Learners. John Wiley & Sons. p. 124. ISBN 978-1-119-28310-2. ^ "The Virtual Olympics". Bloomberg. April 29, 1996. Retrieved March 6, 2019. ^ Ledbetter, D. Orlando (July 20, 2017). "Canton-bound Davis pays homage to UGA". The Atlanta Journal-Constitution. Retrieved March 6, 2019. ^ Vivlamore, Chris (November 22, 2017). "The Hall of Fame case for Hines Ward (with poll)". The Atlanta Journal-Constitution. Retrieved March 6, 2019. ^ Porter, Todd (January 27, 2019). "6 days until Selection Saturday: First-year eligible finalists Champ Bailey, Richard Seymour". The Repository. Retrieved March 6, 2019. ^ Ten Take (April 12, 2009). "NFL Draft Rewind: Philadelphia Eagles Class of 2005". Bleacher Report. Retrieved March 6, 2019. ^ "MLB pitcher Mitchell Boggs returns to UGA as student assistant". Athens Banner-Herald. January 7, 2016. Retrieved March 6, 2019. ^ Culpepper, JuliaKate E. (July 12, 2017). "UGA's Kentavious Caldwell-Pope agrees to deal with Lakers". The Atlanta Journal-Constitution. Retrieved March 6, 2019. ^ Ruppersburg, Hugh; Inscoe, John C. (August 15, 2011). The New Georgia Encyclopedia Companion to Georgia Literature. University of Georgia Press. p. 177. ISBN 978-0-8203-4300-6. ^ Habersham, Raisa (February 16, 2018). "Charlayne Hunter-Gault: Integrating UGA was just the start of her news". The Atlanta Journal-Constitution. Retrieved March 7, 2019. ^ Ketcham, Diane (October 12, 1997). "Deborah Norville on the Rebound". The New York Times. ISSN 0362-4331. Retrieved March 7, 2019. ^ "Deborah Roberts: ABC News Correspondent". ABC News. October 14, 2016. Retrieved March 7, 2019. ^ "ABC names Brookwood High grad Amy Robach '20/20' co-anchor". Gwinnett Daily Post. April 24, 2018. Retrieved March 7, 2019. ^ Dendy, Larry B. (June 4, 2007). "UGA alumna wins Pulitzer Prize for collection of poetry". UGA Today. Retrieved March 7, 2019. ^ Bentley, Rosalind (June 6, 2012). "Emory professor named U.S. poet laureate". The Atlanta Journal-Constitution. Retrieved March 7, 2019. ^ Bentley, Rosalind (November 17, 2016). "Natasha Trethewey, former U.S. Poet Laureate, leaving Emory University". The Atlanta Journal-Constitution. Retrieved March 7, 2019. ^ Unger, Henry (November 20, 2014). "Tom Johnson: 'Do your best to go to the front lines'". The Atlanta Journal-Constitution. Retrieved March 7, 2019. ^ Raymond, Ken (April 3, 2016). "A conversation with author Stuart Woods, who will be featured in Edmond as his latest book launches Tuesday". NewsOK.com. Retrieved March 7, 2019. ^ Brown, Eric Renner (November 1, 2016). "Inside Danger Mouse's Label, 30th Century Records". Entertainment Weekly. Retrieved March 7, 2019. ^ Bonaguro, Alison (March 6, 2018). "Charles Kelley, Dave Haywood Graduate to UGA Speakers". CMT News. Retrieved March 7, 2019. ^ Brown, Rodger Lyle (2016). Party Out of Bounds: The B-52's, R.E.M., and the Kids who Rocked Athens, Georgia. University of Georgia Press. ISBN 9780820350400. ^ Azerrad, Michael; Azerrad, Michael (March 22, 1990). "The B-52s: Mission Accomplished". Rolling Stone. Retrieved March 7, 2019. ^ Melancon, Merritt (May 12, 2010). "Brown talks TV, food, R.E.M." Athens Banner-Herald. Archived from the original on August 15, 2013. ^ Ruthhart, Roger (July 13, 2011). "Duke's deputy Enos, General Lee at speedway". The Dispatch–Argus. Retrieved March 7, 2019. ^ Kahn, Toby (July 4, 1983). "By Talking Both Straight and Silly to Teens, Fred Newman Is Cable's Pied Piper of Puberty". People. Retrieved March 7, 2019. ^ Dozier, Patti (December 9, 2005). "Lanter lands role in drama". Thomasville Times-Enterprise. Retrieved March 7, 2019. ^ Rose, Lacey (February 25, 2015). "Bar-Hopping With Kyle Chandler: 'Bloodline' Star on His "Dark, Evil" Period, Comedy Dreams and Return to TV". The Hollywood Reporter. Retrieved March 7, 2019. ^ Bill, Torpy (May 11, 2013). "Streetwise and Camera Ready". The Atlanta Journal-Constitution. Retrieved March 7, 2019. ^ "Is this it? Wayne Knight, aka Newman, doesn't really see the Seinfeld gang anymore". The Guardian. March 7, 2009. ISSN 0261-3077. Retrieved March 7, 2019. ^ Davis, Janel (May 14, 2016). "University of Georgia graduates get advice from Ryan Seacrest (updated)". The Atlanta Journal-Constitution. Retrieved March 7, 2019. Boney, F. N. "A Walking Tour of the University of Georgia." Athens, GA: U of Georgia. Coulter, E. Merton (1983). College life in the old South: as seen at the University of Georgia. Athens: University of Georgia Press. ISBN 978-0-8203-3199-7. Retrieved February 20, 2018. Dooley, Vince. History and Reminiscences of the University of Georgia. Athens, GA: U. of Georgia P.
Johnson, Amanda. Georgia as Colony and State. Atlanta, Georgia: Walter W. Brown Publishing Co., 1938, pp. 187, 247, 376, 429–430, 569–570. Reed, Thomas Walter. History of the University of Georgia. Athens, GA: U. of Georgia P, 1949. Reed, Thomas Walter. "Uncle Tom" Reed's Memoir of the University of Georgia. Athens, GA: U. of Georgia P, 1974. Wikimedia Commons has media related to University of Georgia.